, an illustrious German divine and reformer of the church, was the son of John Letter, or Lauther, which our reformer changed to Luther, and of Margaret Lindeman, and born at Isleben, a town of Saxony, in the county of Mansfelt, November 10, 1483. His father’s extraction and condition were originally but mean, and his occupation that of a miner; it is probable, however, that by his application and industry he improved the circumstances of his family, for we find him afterwards raised to the magistracy of a considerable rank and dignity in his province. Luther was initiated very early into letters; and, having learned the rudiments of grammar while he continued at home with his parents, was, at the age of thirteen, sent to a school at Magdeburg. Here, however, he remained only one year, for the circumstances of his parents were at that time so very low, and so insufficient to maintain him, that he was forced, as Melchior Adam relates, “Mendicato vivere pane,” to beg his bread for support. From Magdeburg he was removed to a school at Eysenach, a city of Thuringia, for the sake of being among his mother’s relations; for his mother was descended from an ancient and reputable family in that town. Here he applied himself diligently to study for four years; and began to discover all that force and strength of parts, that acuteness and penetration, that warm and rapid eloquence, which afterwards produced such wonderful effects. In 1501 he was sent to the university of Erfurt, where he went through the usual courses of logic and philosophy. But Luther did not find his account in these studies; did not feel that use and satisfaction arising from such verbose and thorny sciences as logic and philosophy then were, which he wanted and wished to feel. He very wisely, therefore, applied himself to read the best ancient writers, such as Cicero, Virgil, Livy, &c. and from them laid in such a fund of good sense as enabled him to see through the defects in the systems of the schools, as well as the superstitions and errors of the church. He took a master’s degree in the university when he was twenty; and read lectures upon Aristotle’s physics, ethics, and other | parts of philosophy. Afterwards, at the instigation of his parents, he studied the civil law, with a view of advancing himself to the bar; but was diverted from this pursuit by an event which he considered as admonitory, and which, by wonderful gradations, led to his future eminence. Walking out into the fields one day, he was struck with lightning, so as to fall to the ground, while a companion was killed by his side; and this affected him so sensibly, that, without communicating his purpose to any of his friends, he withdrew himself from the world, and retired into the order of the hermits of St. Augustine. Here he employed himself in reading St. Augustine and the schoolmen; but, in turning over the books of the library, he found a copy of the Latin Bible, which he had uever seen before. This raised his curiosity to a high degree; he read it over with great avidity, and was amazed to find what a small portion of the scriptures was allowed to reach the ears of the people. He made his profession in the monastery of Erfurt, after he had been a novice one year; and took priest’s orders, and celebrated his first mass in 1507. The year after he wa removed from the convent of Erfurt to the university of Wittemberg which being just founded, nothing was thought more likely to bring it into immediate credit than the authority and presence of a man so celebrated for his great parts and learning as Luther. 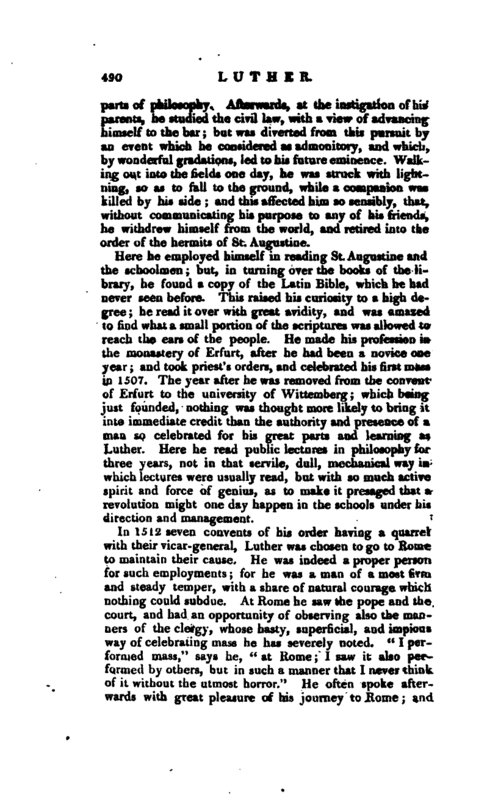 Here he read public lectures in philosophy for three years, not in that servile, dull, mechanical way in which lectures were usually read, but with so much active spirit and force of genius, as to make it presaged that a revolution might one day happen in the schools under his direction and management. In 1512 seven convents of his order having a quarrel with their vicar-general, Luther was chosen to go to Rome to maintain their cause. He was indeed a proper person for such employments; for he was a man of a most firm and steady temper, with a share of natural courage which nothing could subdue. At Rome he saw the pope and the court, and had an opportunity of observing also the manners of the clergy, whose hasty, superficial, and impious way of celebrating mass he has severely noted. “I performed mass,” says he, “at Home; I saw it also performed by others, but in such a manner that I never think of it without the utmost horror.” He often spoke afterwards with great pleasure of his journey to Rome; and | to say that he “wonld not bnt have made it for a thousand florins,” As soon as he had adjusted the dispute which was the business of his journey, he returned to Wittemberg, and was created doctor of divinity, at the expence of Frederic, elector of Saxony, who had often heard him preach, was perfectly acquainted with his merit, and reverenced him highly. Luther, it appears, at first declined the honour of this degree on account of his being, in his own opinion, too young, for he was only in his thirtieth year; but it was told him that “he must suffer himself to be dignified, for that God intended to bring about great things in the church by his means;” which, though it was certainly said in jest, proved at length a very serious truth. He continued in the university of Wittemberg, where, as professor of divinity, he employed himself in the business of his calling. The university, as we have observed, had been lately founded by Frederic, elector of Saxony, who was one of the richest and most powerful princes at that time in Germany, as well as one of the most magnificent and bountiful; and who brought a great many learned men thither, by large pensions and other encouragements, and amongst the rest Luther. Here then he feegan in the most earnest manner to read lectures upon the sacred books: he explained the epistle to the Romans, and the Psalms, which he cleared up and illustrated in a manner so entirely new, and so different from what had been pursued by former commentators, that “there seemed, after a long and dark night, a new day to arise, in the judgment of all pious and prudent men.” He settled the precise difference between the law and gospel, which before had been confounded; refuted many errors, commonly received both in "he church and the schools; and brought many necessary truths to light, which might have bee vainly sought in Scotus and Aquinas. The better to qualify himself for the task he had undertaken, he applied himself attentively to the Greek and Hebrew languages; to which, we are told, he was particularly excited by the writings of Erasmus; who, though he always remained in appearance a papist, or at least had nothing decided in his character, yet contributed much to the impelling of monkish ignorance, and overthrowing the kingdom of darkness. In the mean time, Luther, while he was active in propagating truth and instruction by his lectures and | sermons, maintained an exemplary severity in his life and conversation, and was a most rigid observer of that discipline which he enjoined to others. This gained him vast credit and authority, and made all he delivered, however new or unusual, more readily accepted by. those who heard him. In this manner was he employed when the general indulgences were published in 1517. Leo X. who succeeded Julius II. in March 1513, formed a design of building the magnificent church of St. Peter’s at Rome, which was, indeed, begun by Julius II. but still required very large sums to be finished. The treasure of the apostolic chamber was much exhausted, and the pope himself, though of a rich and powerful family, yet was far from being able to do it at his own proper charge, on account of the excessive debts he had contracted before his advancement to the popedom. There was nothing new in the method of raising money by indulgences. This had been formerly on several occasions practised by the court of Rome; and none had been found more effectual. Leo, therefore, in 1517, published general indulgences throughout all Europe, in favour of those who would contribute any sum to the building of St. Peter’s; and appointed persons in different countries to preach up these indulgences, and to receive money for them. Albert of Brandenburg, archbishop of Mentz and Magdeburg, who was soon after made a cardinal, had a commission for Germany; and Luther assures us that he was to have half the money that was to be raised, which does not seem improbable, for Albert’s court was at that time very luxurious and splendid; and he had borrowed 30,000 florins of that opulent family the Fuggers of Augsburg, to pay the pope for the bulls of his archbishopric, which sum he was bound to repay. Be this however as it will, Albert gave out this commission to John Tetzel, orTecelius, a Dominican friar, and others of his order. 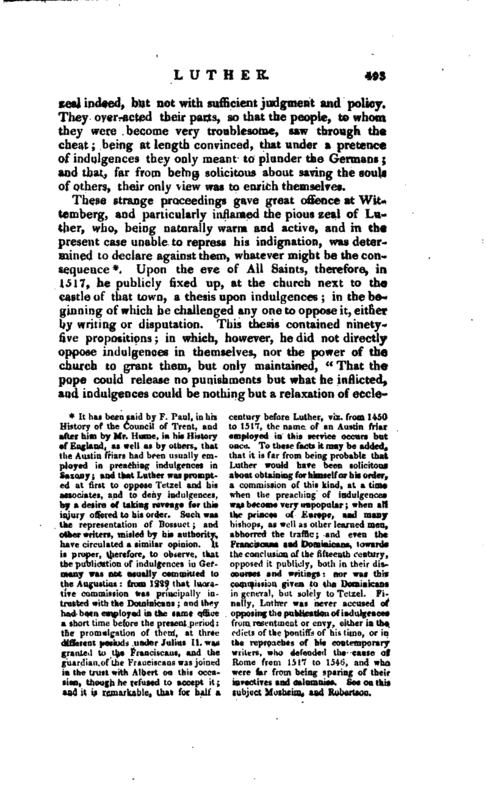 These indulgences were immediately exposed to sale; and Tetzel boasted of “having so large a commission from the pope, that though a man should have deflowered the virgin Mary, yet for money he might be pardoned.” He added further, that “he did not only give pardon for sins past, but for sins to come.” A book came out also at the same time, under the sanction of the archbishop, in which orders were given to the commissioners and collectors to enforce and press the power of indulgences. These persons performed their offices with great | zeal indeed, but not with sufficient judgment and policy. They over-acted their parts, so that the people, to whom they were become very troublesome, saw through the cheat;‘ being at length convinced, that under a pretence of indulgences they only meant to plunder the Germans; and that, far from being solicitous about saving the souls of others, their only view was to enrich themselves. aad it is remarkable, that for half a subject Mosheim, and Robertson. | siastical penalties; that they affected only the living; that the dead were not subject to canonical penances, and so could receive no benefit by indulgences; and that such as were in purgatory could not by them be delivered from the punishment of their sins; that indeed the pope did root grant indulgences to the souls of the dead, by virtue of the power of the keys[? ], but by way of suffrage; that indulgences seldom remit all punishment; that those who believe they shall be saved by indulgences only, shall be damned with their masters; that contrition can procure remission of the fault and punishment without indulgences, but that indulgences can do nothing without contrition; that, however, the pope’s indulgence ia not to be contemned, because it is the declaration of a pardon obtained of God, but only to be preached up with caution, lest the people should think it preferable to good works; that Christians should be instructed, how much better it is to abound in works of mercy and charity to the poor, than to purchase a pardon; and that it is a matter of indifference either to buy, or not to buy, an indulgence; that indulgences are not to be trusted to; that it is hard to say what that treasure of the church is, which is said to be the foundation of indulgences; that it is not the merits of Christ or his saints, because they produce grace in the inner man, and crucify the outward man, without the pope’s interposing; thai this treasure can be nothing but the power of the keys, or the gospel of the glory and grace of God; that indulgences cannot remit the most venial sin in respect of the guilt; that they remit nothing to them who by a sincere contrition have a right to a perfect remission; and that Christians are to be exhorted to seek pardon of their sins by the pains and labour of penance, rather than to get them discharged without reason." This is the doctrine of Luther’s thesis; in which, if he does not attack indulgences directly, he certainly represents them as useless and ineffectual. 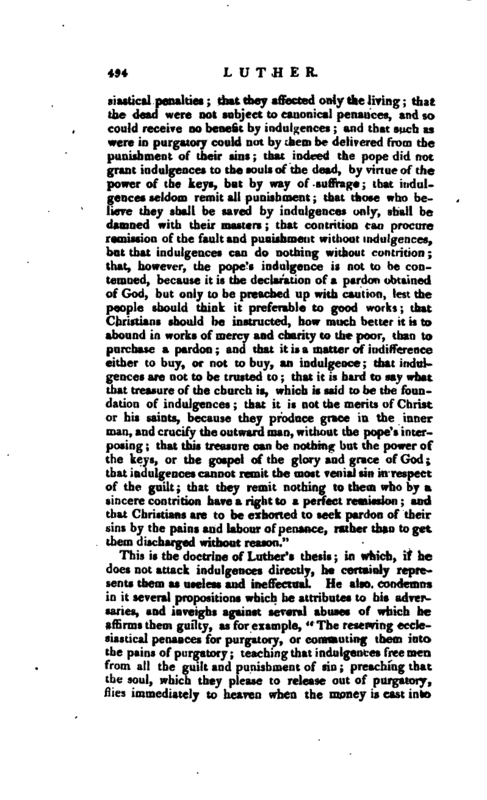 He also condemns in it several propositions which he attributes to his adversaries, and inveighs against several abuses of which he affirms them guilty, as for example, “The reserving ecclesiastical penances for purgatory, or commuting them into the pains of purgatory; teaching that indulgences free men from all the guilt and punishment of sin; preaching that the soul, which they please to release out of purgatory, flies immediately to heaven when the money is cast into | the chest; maintaining, that these indulgences are an inestimable gift, by which man is reconciled to God; exacting from the poor, contrary to the pope’s intentions; causing the preaching the word of God to cease in other churches that they may have a greater concourse of people in those where indulgences are preached; advancing this scandalous assertion, that the pope’s indulgences hare such a virtue, as to be able to absolve a man though he has ravished the mother of God, which is a thing impossible; publishing, that the cross with the arms of the pope, is equal to the cross of Christ, &c. Such positions as these,” says he, “have made people ask, and justly, why the pope, out of charity, does not deliver all souls tfut of purgatory, since he can deliver so great a number for a little money, given for the building of a church? Whv he suffers prayers and anniversaries for the dead, which are certainly delivered out of purgatory by indulgences? 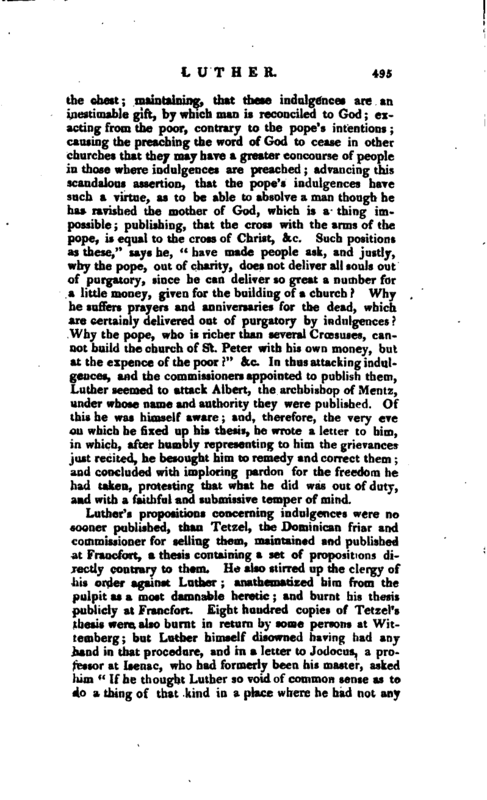 Why the pope, who is richer than several Croesuses, cannot build the church of St. Peter with his own money, but at the expence of the poor r” &c. In thus attacking indulgences, and the commissioners appointed to publish them, Luther seemed to attack Albert, the archbishop of Ment7, under whose name and authority they were published. Of this he was himself aware; and, therefore, the very eve on which he fixed up his thesis, he wrote a letter to him, in which, after humbly representing to him the grievances just recited, he besought him to remedy and correct them; and concluded with imploring pardon for the freedom he had taken, protesting that what he did was out of duty, and with a faithful and submissive temper of mind. Luther’s propositions concerning indulgences were no sooner published, than Tetzel, the Dominican friar and commissioner for selling them, maintained and published at Franc fort, a thesis containing a set of propositions directly contrary to them. He also stirred up the clergy of his order against Luther; anathematized him from the pulpit as a most damnable heretic; and burnt his thesis publicly at Francfort. Eight hundred copies of Tetzel’s thesis were also burnt in return by some persons at Wittemberg; but Luther himself disowned having had any hand in that procedure, and in a letter to Jodocus, a professor at Isenac, who had formerly been his master, asked him “If he thought Luther ao void of common sense as to do a thing of that kind in a place where he had not any | jurisdiction, and against a divine of so great authority as Tetzel?” Luther, indeed, although he perceived that his propositions were very well liked, and entertained as perfectly sound and orthodox, yet behaved himself at first with great calmness and submission. He proposed them to be discussed only in the way of disputation, till the church should determine what was to be thought of indulgences. He wrote to Jerom of Brandenburg, under whose jurisdiction he was, and submitted what he had written to that bishop’s judgment. 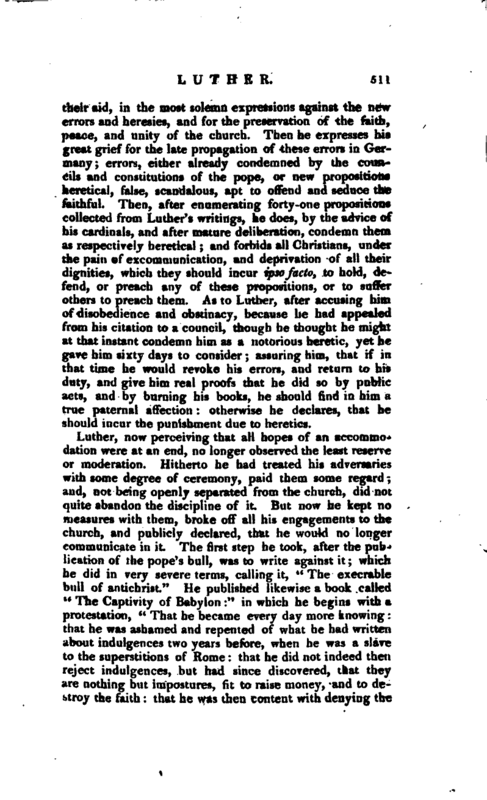 He entreated him either to scratch out with his pen, or commit to the flames, whatever should teem to him unsound; to which, however, the bishop replied, that he only begged him to defer the publication of his propositions; and added, that be wished no discourse had been started about indulgences. Luther complied with the bishop’s request; and declared that “it gave him more pleasure to be obedient, than it would to work miracles, if he was ever so able.” And so much justice must be done to Luther, even by those who are not of his party, as to acknowledge that he was willing to be silent, and to say nothing more of indulgences, provided the same conditions might be imposed upon his adversaries. 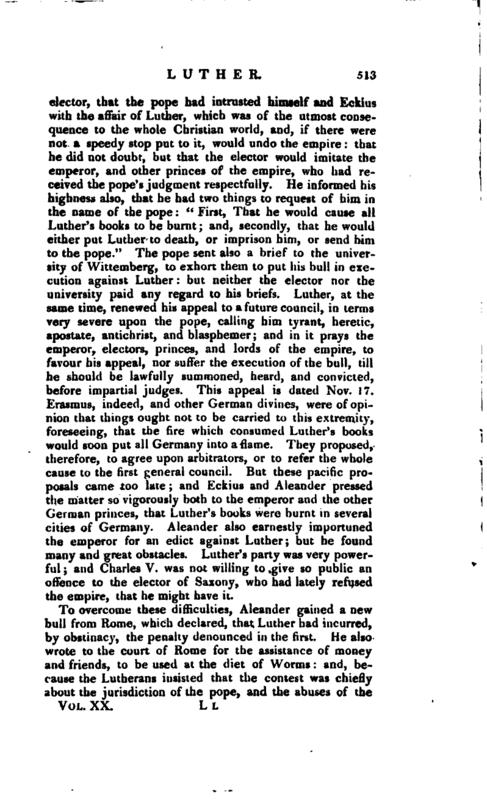 The emperor Maximilian was equally solicitous with the pope, about putting a stop to the propagation of Luther’s opinions in Saxony; since the great number of his followers, and the resolution with which he defended them, made it evident beyond dispute that if he were not immediately checked he would become troublesome both to the church and empire. Maximilian therefore applied to Leo in a letter | dated Aug. 5, 1518, and begged him to forbid by his authority, these useless, rash, and dangerous disputes; assuring him also that he would strictly execute in the empire whatever his holiness should enjoin. 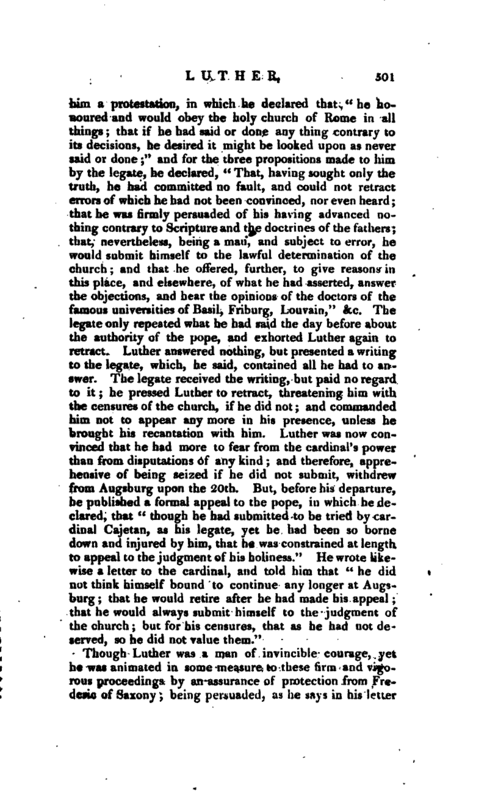 The pope on his part ordered Jerom de Genutiis, bishop of Ascula, or Ascoli, auditor of the apostolic chamber, to cite Luther to appear at Rome within sijcty days, that he might give an account of his doctrine to the auditor and master of the palace, to whom he had committed the judgment of tha^ cause. He wrote at the same time to Frederick the elector of Saxony, to pray him not to protect Luther and let him know that he had cited him, and had given cardinal Cajetan, his legate in Germany, the necessary instructions upon that occasion. He exhorts the elector to put Luther into the hands of this legate, that he might be carried to Rome; assuring him that, if he were innocent, he would send him back absolved, and if he were guilty, would pardon him upon his repentance. This letter to Frederic was dated Aug. 23, 1518, and it was by no means unnecessary; for though Luther had nothing to trust to at first but his own personal qualities, his parts, his learning, and his courage, yet he was afterwards countenanced and supported by this elector, a prince of great personal worth. At the same time also the pope sent a brief to cardinal Cajetan, in which he ordered him to bring Luther before him as soon as possible; and to hinder the princes from being any impediment to the execution of this order, he denounced the punishments of excommunication, interdiction, and privation of goods against all who should receive Luther, and give him protection; and promised a plenary indulgence to those who should assist in delivering him up. In the mean time Luther, as soon as he understood what was transacting about him at Rome, used all imaginable means to prevent his being carried thither, and to obtain a hearing of his cause in Germany. 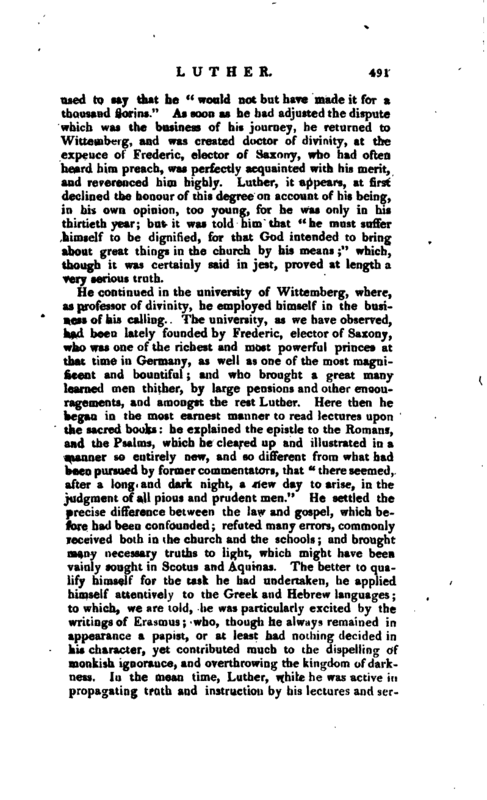 The university of Wittemberg interceded for him, and wrote a letter to the pope, to excuse him from going to Rome, because his health would not permit it; and assured his holiness that he had asserted nothing contrary to the doctrine of the church, and that all they could charge him with was his layingdown some propositions in disputation too freely, though without any view of deciding upon them. The elector also was against Luther’s going to Rome, and desired of | cardinal Cajetan, that be might be heard before him, as his legate in Germany. Upon these addresses, the pope consented that the cause should be tried before cardinal Cajetan, to whom he had given power to decide it. Luther, therefore, set off immediately for Augsburg, poor, and on foot, as he says in his narrative, and carried with him letters from the elector*. He arrived here in October 1518, and upon an assurance of his safety, was admitted into the cardinal’s presence. 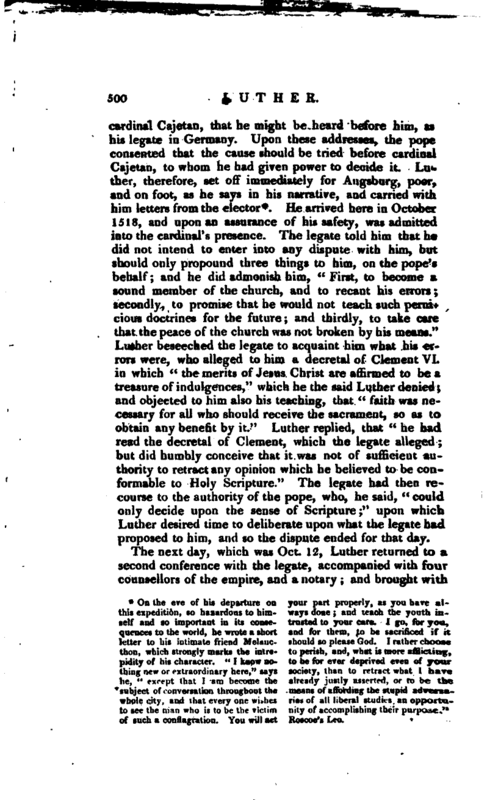 The legate told him that he did not intend to enter into any dispute with him, but should only propound three things to him, on the pope’s behalf; and he did admonish him, “First, to become a sound member of the church, and to recant his errors; secondly, to promise that he would not teach such pernicious doctrines for the future; and thirdly, to take care that the peace of the church was not broken by his means.” Luther beseeched the legate to acquaint him what his errors were, who alleged to him a decretal of Clement VI. in which “the merits of Jesus Christ are affirmed to be a treasure of indulgences,” which he the said Luther-denied; and objected to him also his teaching, that “faith was necessary for all who should receive the sacrament, so as to obtain any benefit by it.” Luther replied, that “he had read the decretal of Clement, which the legate alleged; but did humbly conceive that it was not of sufficient authority to retract any opinion which he believed to be conformable to Holy Scripture.” The legate had then recourse to the authority of the pope, who, he said, “could only decide upon the sense of Scripture;” upon which Luther desired time to deliberate upon what the legate had proposed to him, and so the dispute ended for that day. 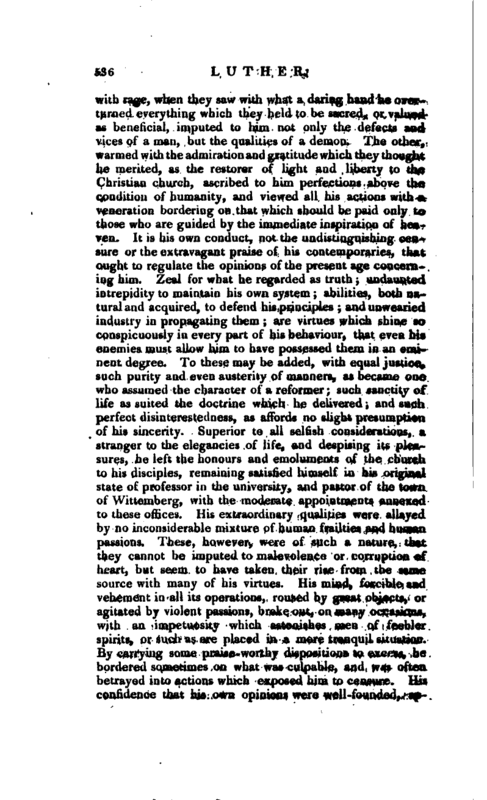 subject of conversation throughout the means of affording the stupid adversawhole city, and that every one wishes ries of all liberal studies an opportuto see the man who is to be the victim nily of accomplishing their purpose." 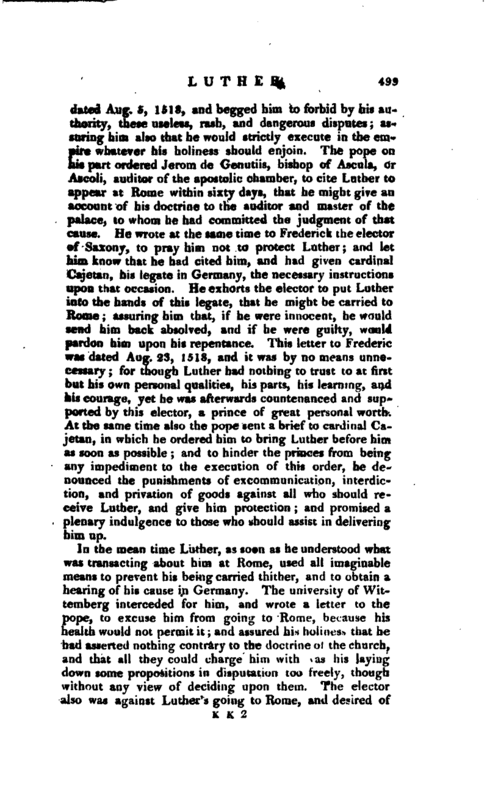 Though Luther was a man of invincible courage, jet he was animated in some measure to these firm and vigorous proceedings by an assurance of protection from Frederic of Saxony; being persuaded, as he says in his letter | to the legate, that an appeal would be more agreeable to that elector, than a recantation. On this account, the first thing which the legate did, after Luther’s departure, was to send an account to the elector of what had passed at Augsburg. He complained that Luther left him without taking leave, and without his knowledge; and although he had given him hopes that he would retract and submit, yet had retired without affording him the least satisfaction. He acquainted the elector that Luther had advanced and maintained several propositions of a most damnable nature, and contrary to the doctrine of the holy see. He prays him to discharge his conscience, and to keep unspotted the honour of his illustrious house, by either sending him to Rome, or banishing him from his dominions. He assured him that this matter could not continue long as it was at present, but would soon be prosecuted at Rome; and that, to get it out of his own hands, he had written to the pope about it. When this letter, Oct. 25, 1518, was delivered to the elector, he communicated it to Luther, who immediately drew up a defence of himself against it. In this defence he offers to the elector to leave his country, if his highness thought proper, that he might be more at liberty to defend himself against the papal authority, without bringing any inconveniences upon his highness by that means. But his friends advised him very wisely to remain in Saxony; and the university of Whtemberg presented an address to the elector, praying him to afford Luther so much favour and protection, that he might not be obliged to recant his opinions, till it was made appear that they ought to be condemned. 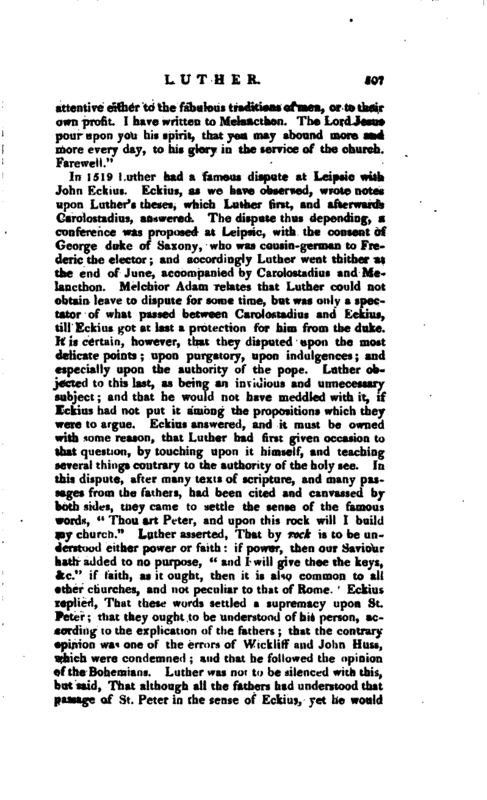 But this address was needless; the elector was resolved not to desert Luther, and told the legate in an answer, Dec. the 18th, that he “hoped he would have dealt with Luther in another manner, and not have obliged him to recant before his cause was heard and judged; and that there were several men in his own and in mher universities, who did not think Luther’s doctrine either impious or heretical; that if he had believed it such, there would have been no need of admonishing him not to tolerate it; that Luther not being convicted of heresy, he could not banish him from his states, nor send him to Rome; and that, since Luther offered to submit himself to the judgment of the universities, he thought they ought to hear him, or at least shew him the error* which he taught in his writings.” Luther, seeing himself | thus supported, continued to teach the same doctrines at Wittemberg, and sent a challenge to all the inquisitors to come and dispute with him; offering them not only a safe conduct from his prince, but assuring them also of good entertainment, and that their charges should be borne so long as they remained in Wittemberg. 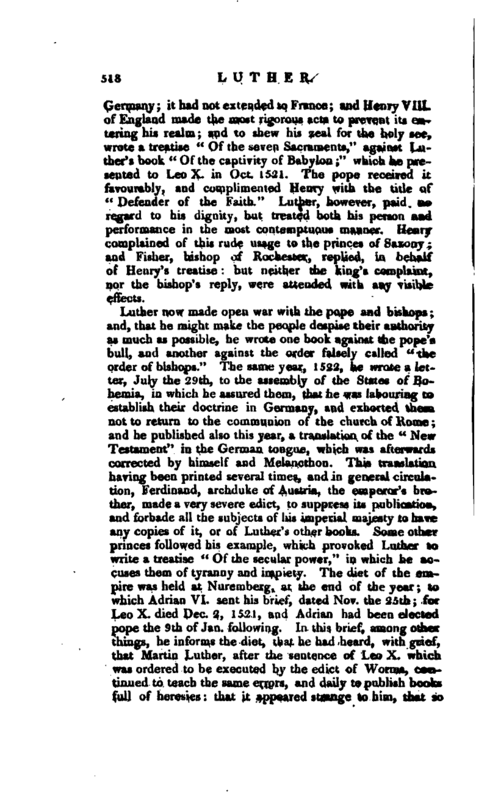 While these things passed in Germany, Leo attempted to put an end to these disputes about indulgences, by a decision of his own; and for that purpose, November the 9th, published a brief, directed to cardinal Cajetan, in which he declared, that “the pope, the successor of St. Peter, and vicar of Jesus Christ upon earth, hath power to pardon, by virtue of the keys, the guilt and punishment of sin, the guilt by the sacrament of penance, and the temporal punishments due for actual sins by indulgences; that these indulgences are taken from the overplus of the merits of Jesus Christ and his saints, a treasure at the pope’s own disposal, as well by way of absolution as suffrage; and that the dead and the living, who properly and truly obtain these indulgences, are immediately freed from the punishment due to their actual sins, according to the divine justice, which allows these indulgences to be granted and obtained.” This brief ordains, that “all the world shall hold and preach this doctrine, under the pain of excommunication reserved to the pope; and enjoins cardinal Cajetan to send it to all the archbishops and bishops of Germany, and c:iuse it to be put into execution by them.” Luther knew very well that after this judgment made by the pope, he could not possibly escape being proceeded against, and condemned at Rome; and therefore, upon the 28th of the same month, published a new appeal from the pope to a general council, in which he asserts the superior authority of the latter over the former. The pope, foreseeing that he should not easily manage Luther so long as the elector of Saxony continued to support and protect him, sent the elector a golden rose, such an one as he used to bless every year, and send to several princes, as marks of his particular favour to them. Miltitius, or Miltitz, his chamberlain, who was a German, was intrusted with this commission; by whom the pope sent also letters in Jan. 1519, to the elector’s counsellor and secretary, in which he prayed those ministers to use all possible interest with their master, that he would stop the progress of Luther’s errors, and imitate therein the piety of his ancestors. | It appears by Sectendorf ’s account of Miltitz’s negotiation, that Frederick had long solicited for this bauble from the pope; and that three or four years before, when his electoral highness was a bigot to the court of Rome, it had probably been a most welcome present. Bat it was now too late: Luther’s contests with the see of Rome had opened the elector’s eyes, and enlarged his mind; and therefore, when Miltitz delivered his letters, and discharged his commission, he was received but coldly by the elector, who valued not the consecrated rose, nor would receive it publicly and in form, but only privately, and by his proctor; and to the remonstrances of Miltitz respecting Luther, answered that he would not act as a judge, nor oppress a man whom he had hitherto considered as innocent. It is thought that the death of the emperor Maximilian, who expired on the 12th of this month, greatly altered the face of affairs, and made the elector more able to determine Luther’s fate. Miltitz thought it best, therefore, to try what could be done by fair and gentle means, and to that end came to a conference with Luther. He poured forth many commendations upon him, and earnestly intreated him that he would himself appease that tempest which could not but be destructive to the church. He blamed at the same time the behaviour and conduct of Tetzel; whom he called before him, and reproved with so much sharpness, that he died of melancholy a short time after. Luther, amazed at all this civil treatment, which he had never before experienced, commended Miltitz highly, owned that, if they had behaved to him so at lirst, all the troubles occasioned by these disputes, had been avoided; and did not forgt-t to cast the blame upon Albert archbishop of Mentz, who had increased these troubles by his severity. 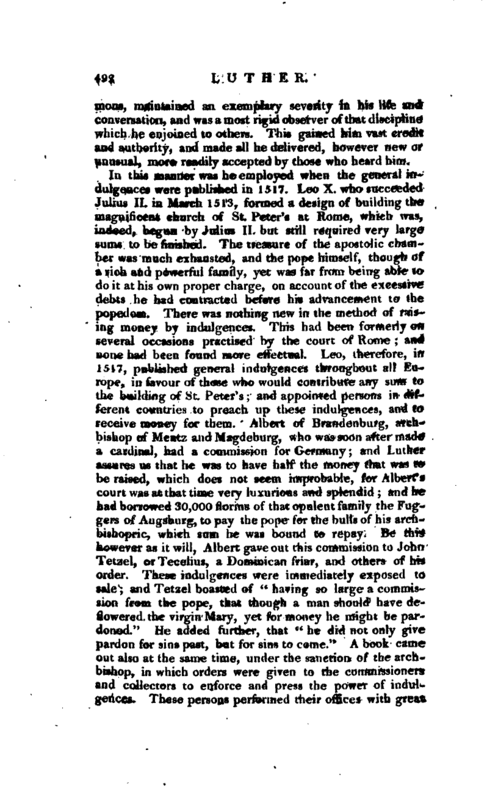 Miltitz also made some concessions; as, that the people had been seduced by false opinions about indulgences, that Tetzel had given the occasion, that the archbishop had employed Tetzel to get money, that Tetzel had exceeded the bounds of his commission, &c. This mildness and seeming candour on the part of Miltitz gained so wonderfully upon Luther, that he wrote a most submissive letter to the pope, on March 13, 1519. 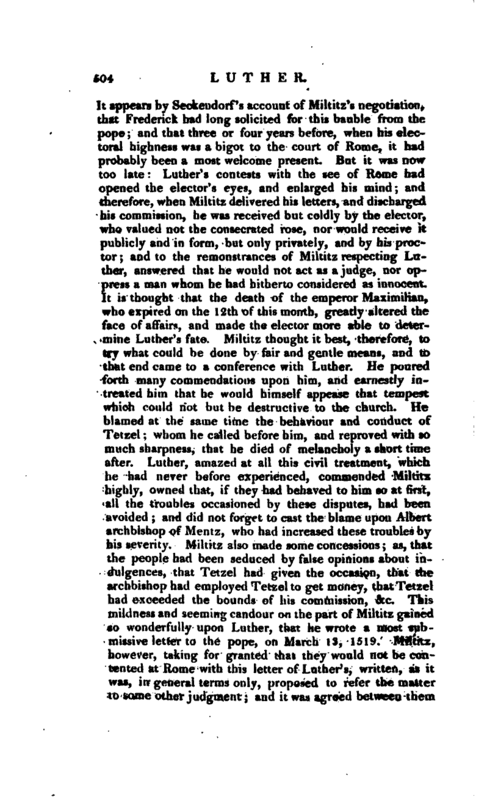 Miltitz, however, taking for granted that they would not be contented at Rome with this letter of Luther’s, written, as it was, in general terms only, proposed to refer the matter to some othec judgment; and it was agreed between them | that the elector of Triers should be the judge, and Coblentz the place of conference; but this came to nothing; for Luther afterwards gave some reasons for not going to Coblentz, and the pope would not refer the matter to the elector of Triers. During all these treaties, the doctrine of Luther spread, and prevailed; and he himself received great encouragement at home and abroad. The Bohemians about this time sent him a book of the celebrated John Huss, who had fallen a martyr in the work of reformation; and also letters, in which they exhorted him to constancy and perseverance, owning, that the divinity which he taught was the pure, sound, and orthodox divinity. Many great and learned men had joined themselves to him: among the rest Philip Melancthon, whom Frederic had invited to the university of Wittemberg in August 1518, and Andrew Carolostadius, archdeacon of that town, who was a great linguist. They desired, if possible, to draw over Erasmus to their party; and to that end we find Melancthon thus expressing himself in a letter to that great man, dated Leipsic, Jan. 5, 1519: “Martin Luther, who has a very great esteem for you, wishes of all things that you would thoroughly approve of him;” and Luther himself wrote to Erasmus, in very respectful and even flattering terms. The elector of Saxony was desirous also to know Erasmus’s opinion of Luther, and might probably think, that as Erasmus had most of the monks for his enemies, and some of those who were warmest against Luther, he might easily be prevailed on to come over to their party. It would, indeed, have, been a considerable object, if they could have gained this point; for the reputation of Erasmus was so great, that if he had once declared for Luther, almost all Germany would have declared along with him. This same year 1519, Luther’s books concerning indulgences were formally censured by the divines of Louvain and Cologne. The former having consulted with the cardinal of Tortosa, afterwards Adrian VI. passed their censure on the 7th of November; and the censure of the lakter, which was made at the request of the divines of Louvain, was dated on the 30th of August. Luther wrote immediately against these censures, and declared that be valued them not: that several great and good men, such as Occam, Picus Mirandula, Laurentius Valla, and others, had been condemned in the same unjust manner; nay, he would venture to add to the list, Jerom of Prague and John Huss. He charged those universities with rashness, in being the first that declared against him; and accused them of want of proper respect and deference to the holy see, in condemning a book presented to the pope, on which judgment had not yet been passed. About the end of this year, Luther published a book, in which be contended for the communion being celebrated in both kinds. This was condemned by the bishop of Misnia, Jan. 24, 1520. 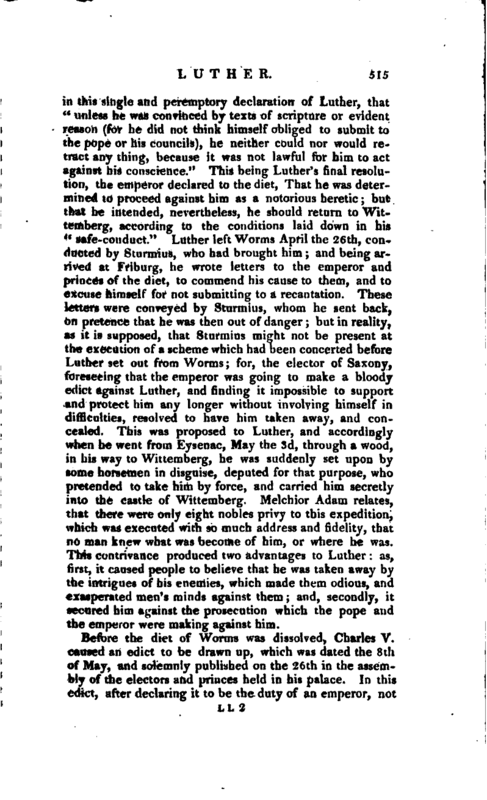 Lnther, seeing himself so beset with adversaries’, wrote a letter to the new emperor, Charles V. of Spain, | who was not yet come into Germany, and another to the elector of Mentz; in both which he humhly implores protection, till he should be able to give an account of himself and his opinions; adding, that he did not desire to be defended, if he were convicted of impiety or heresy, but only that he might not be condemned without a hearing. The former of these letters is dated Jan. 15, 1520; the latter, Feb. 4. The elector Frederic fell about this time into a dangerous illness, which threw the whole party into great consternation, and occasioned some apprehensions at Wittemberg: but of this he happily recovered. 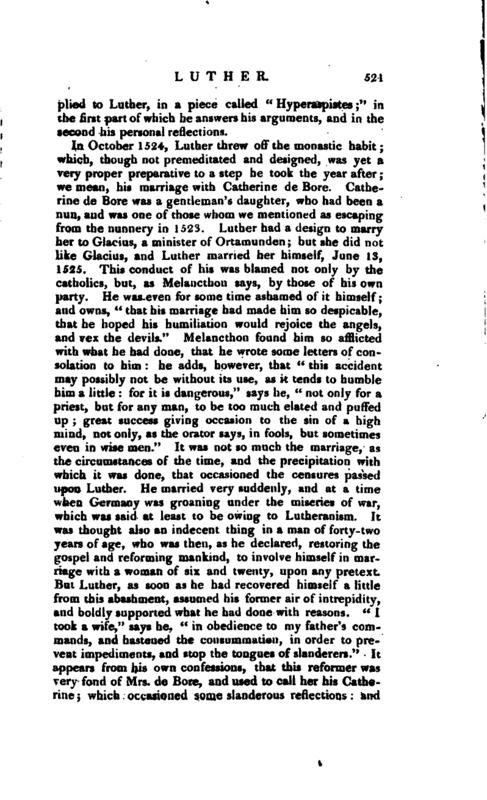 The continual importunities of Luther’s adversaries with Leo caused him at length to publish a formal condemnation of him, in a bull dated June 15, 1520. In the beginning of this bujl, the pope directs his bpeech to Jesus Christ, to St. Peler, St. Paul, and all the saints, invoking | their aid, in the most solemn expressions against the new errors and heresies, and for the preservation of the faith, peace, and unity of the church. Then he expresses hi? great grief for the late propagation of these errors in Germany; errors, either already condemned by the councils and constitutions of the pope, or new propositions heretical, false, scandalous, apt to offend and seduce the faithful. Then, after enumerating forty-one propositions collected from Luther’s writings, he does, by the advice of his cardinals, and after mature deliberation, condemn them as respectively heretical; and forbids all Christians, under the pain of excommunication, and deprivation of all their dignities, which they should incur ipso facto, to hold, defend, or preach any of these propositions^ or to suffer others to preach them. As to Luther, after accusing him of disobedience and obstinacy, because he had appealed from his citation to a council, though he thought he might at that instant condemn him as a notorious heretic, yet be gave him sixty days to consider; assuring him, that if in that time he would revoke his errors, and return to his duty, and give him real proofs that he did so by public acts, and by burning his books, he should find in him a true paternal affection: otherwise he declares, that he should incur the punishment due to heretics. Luther, now perceiving that all hopes of an accommodation were at an end, no longer observed the least reserve or moderation. Hitherto he had treated his adversaries with some degree of ceremony, paid them some regard; and, not being openly separated from the church, did not quite abandon the discipline of it. But now he kept no measures with them, broke off all his engagements to the church, and publicly declared, that he would no longer communicate in it. 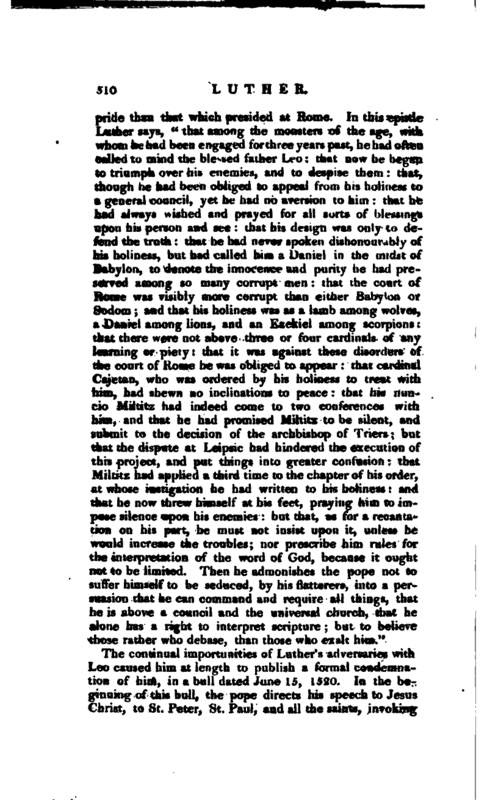 The first step he took, after the publication of the pope’s bull, was to write against it; which he did in very severe terms, calling it, “The execrable bull of antichrist.” He published likewise a book called “The Captivity of Babylon” in which he begins with a protestation, “That he became every day more knowing: that he was ashamed and repented of what he had written about indulgences two years before, when he was a slave to the superstitions of Rome: that he did not indeed then reject indulgences, but had since discovered, tliat they are nothing but impostures, fit to raise money, and to destroy the faith: that he was then content with denying the | papacy to be jure divino, but had lately been convinced that it was the kingdom of Babylon: that he then wished a general council would settle the communion in both kinds, but npw plainly saw, that it was commanded by scripture: that he did absolutely deny the seven sacraments, owning no more than three, baptism, penance, and the Lord’s supper,” &c. About the same time also, he published another treatise in the German language, to make the court of Rome odious to the Germans; in which “he gives a history of the wars raised by the popes against the emperors, and represents the miseries Germany had suffered by them. He strives to engage the emperor and princes of Germany to espouse his party against the pope,‘ by maintaining, that they had the same power over the clergy as they had over the laity, and that there was no appeal from their jurisdiction. He advised the whole nation to shake off the pope’s power; and proposes a reformation, by which he subjects the pope and bishops to the power of the emperor, &c.” Lastly, that he might not be wanting in any thing which should testify his abhorrence of the proceedings in the court of Rome, Luther determined to treat the pope’s bull and decretals in the same manner as they had ordered his writings to be treated: and therefore, calling the students at Wittemberg together, he flung them into a fire prepared for that purpose; saying, “Because thou hast troubled the holy one of God, let eternal fire trouble thee.” This ceremony was performed, Dec. 10, 1520. The bull of Luther’s condemnation was carried into Germany, and published there by Eckius, who had solicited it at Rome; and who, together with Jerom Aleander, a person eminent for his learning and eloquence, was intrusted by the pope with the execution of it. In the mean time, Charles V. of Spain, after he had adjusted the affairs of the Low Countries, went into Germany, and was crowned emperor, Oct. the 21st, at Aix-la-Chapelle. The plague preventing his remaining long in that city, he went to Cologne, and appointed a diet at Worms, to meet Jan. the 6tb, 1521. Frederic, elector of Saxony, could not be present at the coronation, but was left sick at Cologne, where Aleander, who accompanied the emperor, presented him with a brief, which the pope had sent by him, and by which his holiness gave him notice of the decree he had made against the errors of Luther. 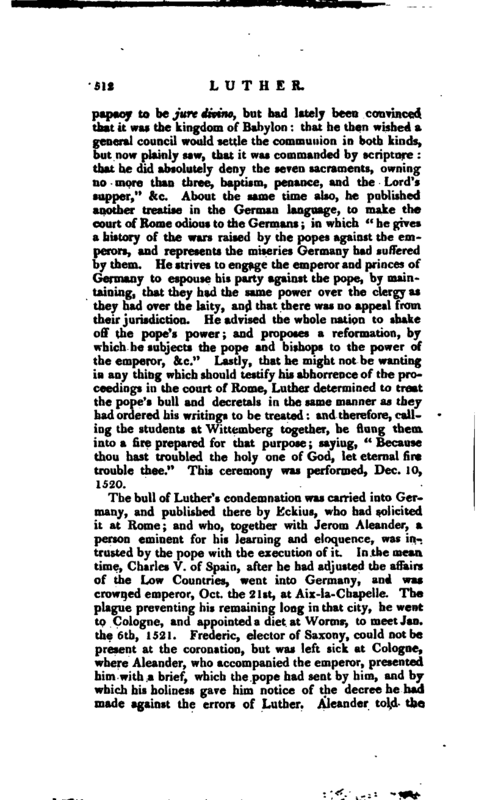 Aleander told the | elector, that the pope had intrusted himself and Eckius with the affair of Luther, which was of the utmost consequence to the whole Christian world, and, it’ there were not a speedy stop put to it, would undo the empire: that he did not doubt, but that the elector woifld imitate the emperor, and other princes of the empire, who had received the pope’s judgment respectfully. 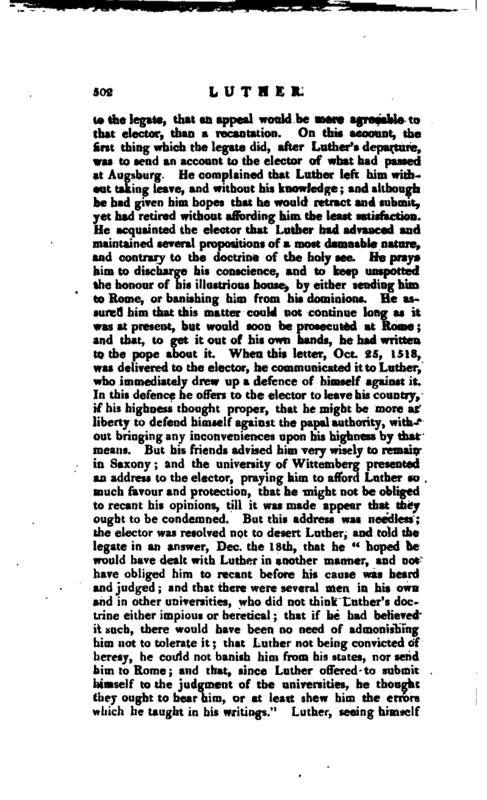 He informed his highness also, that he had two things to request of him in the name of the pope: “First, That he would cause all Luther’s books to be burnt; and, secondly, that he would either put Luther to death, or imprison him, or send him to the pope.” The pope sent also a brief to the university of Wittemberg, to exhort them to put his bull in execution against Luther; but neither the elector nor the university paid any regard to his briefs. Luther, at the same time, renewed his appeal to a future council, in terms very severe upon the pope, calling him tyrant, heretic, apostate, antichrist, and blasphemer; and in it prays the emperor, electors, princes, and lords of the empire, to favour his appeal, nor suffer the execution of the bull, till he should be lawfully summoned, heard, and convicted, before impartial judges. This appeal is dated Nov. 17. Erasmus, indeed, and other German divines, were of opinion that things ought not to be carried to this extremity, foreseeing, that the fire which consumed Luther’s books would soon put all Germany into a flame. They proposed, therefore, to agree upon arbitrators, or to refer the whole cause to the first general council. But these pacific proposals came too late; and Eckius and Aleander pressed the matter so vigorously both to the emperor and the other German princes, that Luther’s books were burnt in several cities of Germany. Aleander also earnestly importuned the emperor for an edict against Luther; but he found many and great obstacles. Luther’s party was very powerful; and Charles V. was not willing to give so public an offence to the elector of Saxony, who had lately refused the empire, that he might have it. He arrived accordingly at Worms April 16, where a prodigious multitude of people were assembled, for the sake of seeing a man of whom so much had no.w been heard. When he appeared before the diet, he had two questions put to him by John Eckius: “First, whether h$ owned those books for his that went under his name; and, secondly, Whether he intended to retract or defend what was contained in them.” These queries produced an altercation, which lasted some days; but which ended at length | in this single and peremptory declaration of Luther, that “unless he was convinced by texts of scripture or evident reason (for he did not think himself obliged to submit to the pope or his councils), he neither could nor would retract any thing, because it was not lawful for him to act against nis conscience.” This being Luther’s final resolution, the emperor declared to the diet, That he was determined to proceed against him as a notorious heretic; but that he intended, nevertheless, he should return to Wittemberg, according to the conditions laid down in his “safe-conduct.” Luther left Worms April the 26th, coft* ducted by Sturmius, who had brought him and being arrived at Friburg, he wrote letters to the emperor and princes of the diet, to commend his cause to them, and to excuse himself for not submitting to a recantation. These letters wt re conveyed by Sturmius, whom he sent back, on pretence that he was then out of danger; but in reality, as it is supposed, that Sturmius might not be present at the execution of a scheme which had been concerted befofe Luther set out from Worms; for, the elector of Satfony, foreseeing that the emperor was going to make a bloody edict against Luther, and finding it impossible to support and protect him any longer without involving himself in difficulties, resolved to have him taken away, and concealed. This was proposed to Luther, and accordingly when he went from Eysenac, May the 3d, through a wood, in his way to Wittemberg, he was suddenly set upon by some horsemen in disguise, deputed for that purpose, who pretended to take him by force, and carried him secretly into the castle of Wittemberg. Melchior Adam relates, that there were only eight nobles privy to this expedition, which was executed with so much address and fidelity, that no man knew what was become of him, or where he was. This contrivance produced two advantages to Luther: as, first, it caused people to believe that he was taken away by the intrigues of his enemies, which made them dious, and exasperated men’s minds against them; and, secondly, it secured him against the pr isecution which the pope and the empe or were making against him. Before the diet of Worms was dissolved, Charles V. caused an edict to be drawn up, which was dated the 8th of May, and solemnly published on the 2oth in the assembly of the electors and princes held in his palace. 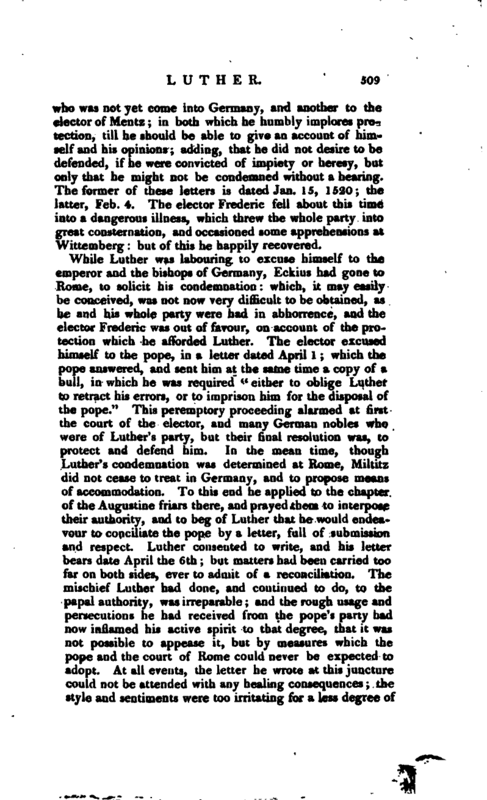 In this edict, after declaring it to be the duty of an emperor, not | only to defend the limits of the empire, but to maintain religion and the true faith, and to extinguish heresies in their original, he commands, That Martin Luther be, agreeably to the sentence of the pope, henceforward looked upon as a member separated from the church, a schismatic, and an obstinate and notorious heretic. 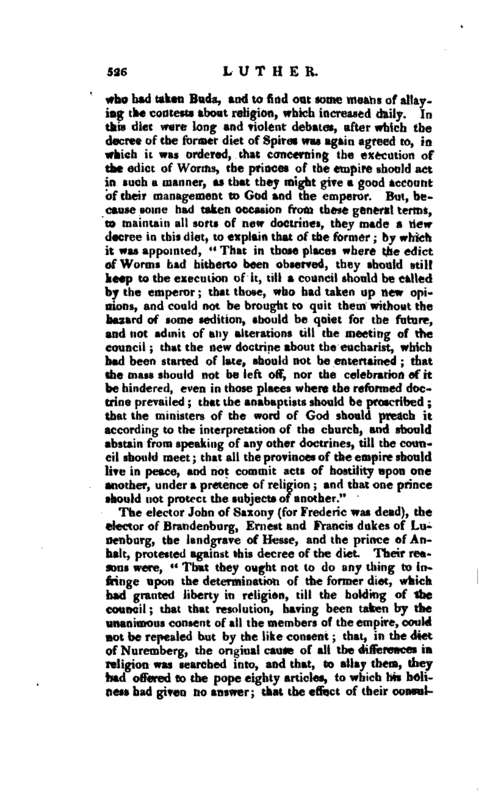 He forbids all persons, under the penalty of high treason, loss of goods, and being put under the ban of the empire, to receive or defend, maintain or protect him, either in conversation or in writing; and he orders, that, after the twenty-one days allowed in his safe-conduct, he should be proceeded against according to the form of the ban of the empire, in what place soever he should be: or, at least, that he should be seized and imprisoned, till his imperial majesty’s pleasure should be further known. 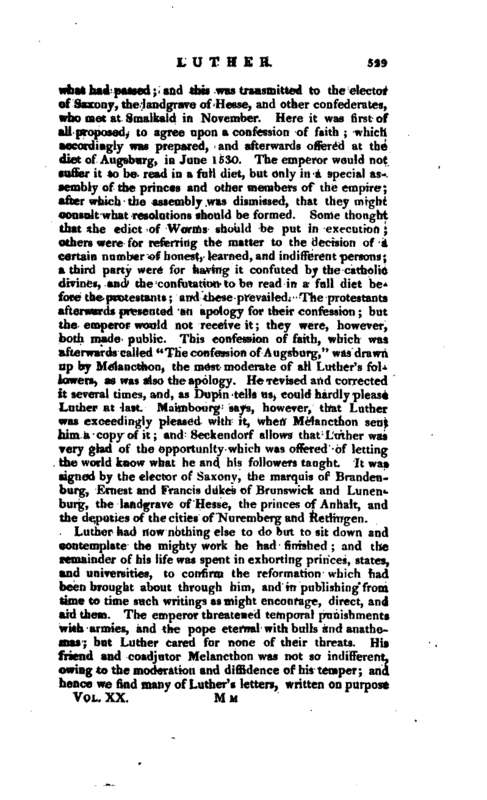 The same punishments are denounced against all the accomplices, adherents, followers, or favourers of Luther; and also all persons are forbidden to print, sell, buy, or read any of his books: and, because there had been published several books concerning the same doctrines, without his name, and several pictures dispersed that were injurious to the pope, cardinal, and bishops, he commands the magistrates to seize and burn them, uod to punish the authors and printers of those pictures and libels. Lastly, it forbids in general the printing of any book concerning matters of faith, which hath not the approbation of the ordinary, and some neighbouring university. Weary at length of his retirement, he appeared publicly again at Wittemberg, March 6, 1522, after he had been absent about ten months. He appeared indeed without the elector’s leave, but immediately wrote him a letter, to prevent his being offended. The diet of Charles V. severe as it was, had given little or no check to Luther’s doctrine; for the emperor was no sooner gone into Flanders, than his edict was neglected and despised, and the doctrine seemed to spread even faster than before. Carolostadius, in Luther’s absence, had acted with even more vigour than his leader, and had attempted to abolish the use of mass, to remove images out of the churches, to set aside auricular confession, invocation of saints, the abstaining from meats; had allowed the monks to leave their monasteries, to neglect their vows and to marry, and thus had quite changed the doctrine and discipline of the church at Wittemberg: all which, though not against Luther’s sentiments, was yet blamed by him, as being rashly and nnseasonably done. The reformation was still confined to | Germany; it had not extended to France; and Henry V11I. of England made the most rigorous acts to prevent its entering his realm; and to shew his zeal for the holy see, wrote a treatise “Of the seven Sacraments,” against Luther’s book “Of the captivity of Babylon;” winch he presented to Leo X. in Oct. 1521. The pope received it favourably, and complimented Henry with the title of “Defender of the Faith.” Luther, however, paid no regard to his dignity, but treated both his person and performance in the most contemptuous manner. Henry complained of this rude usage to the princes of Saxony; and Fisher, bishop of Rochester, replied, in hehall‘ of Henry’s treatise: but neither the king’s complaint, nor the bishop’s reply, were attended with any visible effects. Luther now made open war with the pope and bishops; and, that he might make the people despise their authority as much us possible, he wrote one book against the pope’s bull, and another against the order falsely culled “the order of bishops.” The same year, 1522, he wrote a loiter, July the 29tn, to the assembly of the States of Bohemia, in which he assured them, that he was labouring to establish their doctrine in Germany, and exhorted them not to return to the communion of the church of Rome; and he published also this year, a translation of the “New Testament” in the German tongue, which was afterwards corrected by himself and Melancthon. 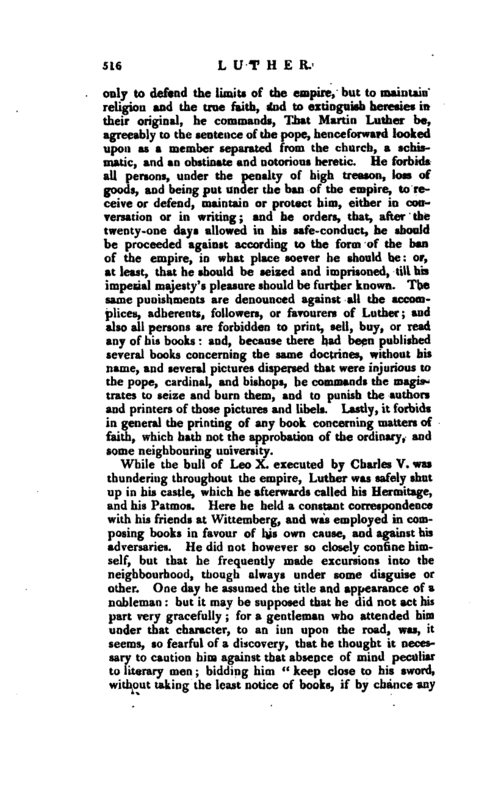 This translation having been printed several times, and in general circulation, Ferdinand, archduke of Austria, the emperor’s brother, made a very severe edict, to suppress its publication, and forbade all the subjects of his imperial majesty to have any copies of it, or of Luther’s other books. Some other princes followed his example, which provoked Luther to write a treatise “Of the secular power,” in which he accuses them of tyranny and impiety. The diet of the empire was held at Nuremberg, at the end of the year; to which Adrian VI. sent his brier’, dated Nov. the 25th; for Leo X, died Dec. 2, 1521, and Adrian bad been elected pope the 9th of Jan. following. 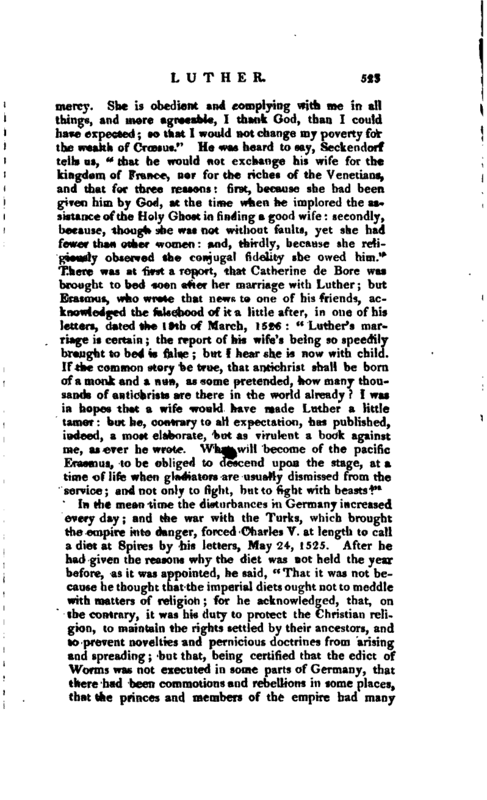 In this brief, among other things, he informs the diet, that he had heard, with grief, that Martin Luther, after the sentence of Leo X. which was ordered to be executed by the edict of Worms, continued to teach the same errors, and daily to publish books full of heresies: that it appeared strange to him, that so | large and so religious a nation could be seduced by a wretched apostate friar: that nothing, however, could be more pernicious to Christendom: and that, therefore, he e.thorts them to use their utmost endeavours to make Luther, and the authors of these tumults, return to their duty; or, if they refuse and continue obstinate, to proceed against them according to the laws of the empire, and the severity of the last edict. The resolution of this diet was published in the form of an edict, March 6, 1523; but it had no effect in checking the Lutherans, who still went on in the same triumphant wanner. This year Luther wrote a great many tracts: among the rest, one upon the dignity and office of the supreme magistrate; with which Frederic elector of Saxony is said to have been highly pleased. 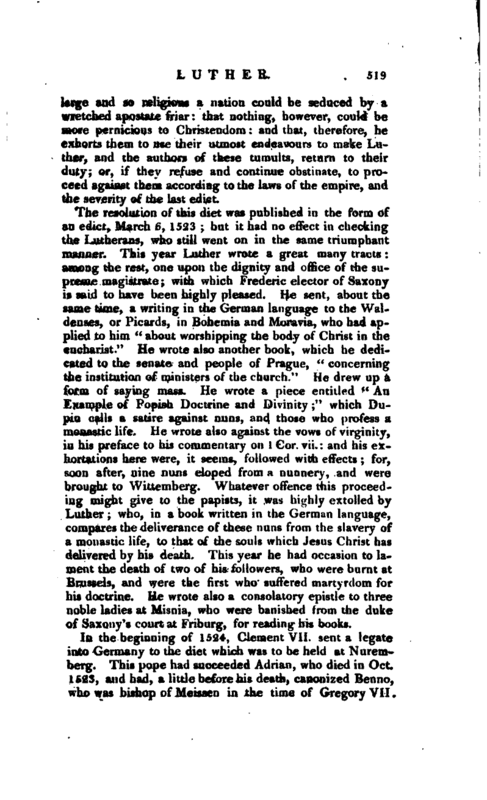 He sent, about the same time, a writing in the German language to the Waldenses, or Picards, in Bohemia and Moravia, who had applied to him “about worshipping the body of‘ Christ in the eucharist.” He wrote also another book, which he dedicated to the senate and people of Prague, “concerning the institution of ministers of the church.” He drew up a form of saying mass. 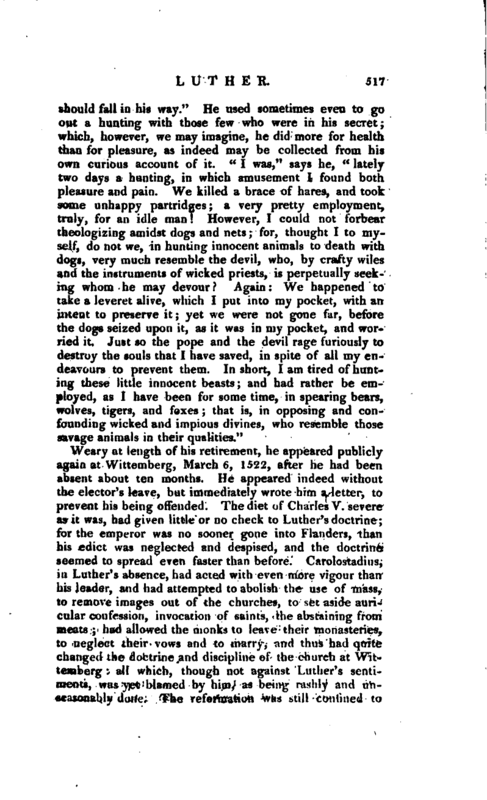 He wrote a piece entitled " Ad Example of Popish Doctrine and Divinity;: ’ which Dnpin calls a satire against nuns, and those who profess a monastic life. He wrote also against the vows of virginity, in his preface to his commentary on 1 Cor. vii. : and his exhortations here were, it seems, followed with effects; for, soon after, nine nuns eloped from a nunnery, and were brought to Wittemberg. Whatever offence this proceeding might give to the papists, it was highly extolled by Luther; who, in a book written in the German language, compares the deliverance of these nuns from the slavery of a monastic life, to that of the souls whichJesus Christ has; delivered by his death. This year he had occasion to lament the death of two of his followers, who were burnt ar Brussels, and were the first who suffered martyrdom for his doctrine. He wrote also a consolatory epistle to thre* noble ladies at Misnia, who were banished from the duke of Saxony’s court at Friburg, for reading his books. In the beginning of 1524, Clement VII. 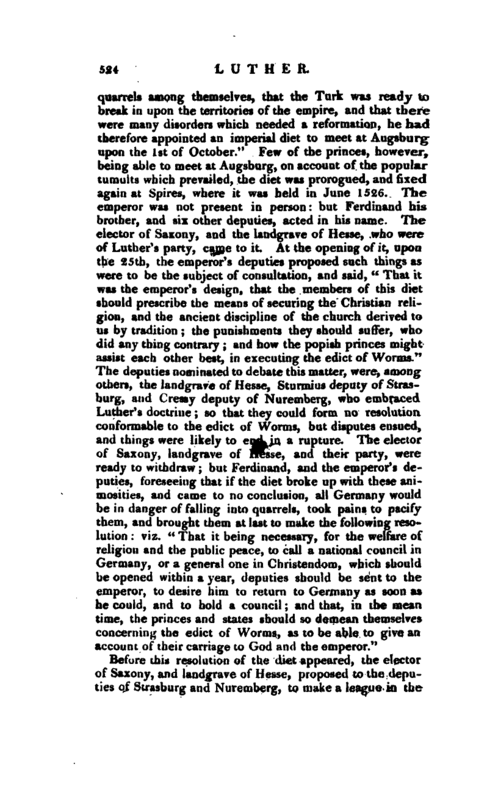 sent a legate into Germany to the diet which was to be held at Nuremberg. This pope had succeeded Adrian, who died in Oct. 1523, and had, a little before his death, canonized Benno, who Was bishop of Meissen in the time of Gregory VII. | and one of the most zealous defenders of the holy se. Luther, imagining that this was done directly to oppose him, drew up a piece with this title, “Against the new Idol and Devil set up at Meissen;” in which he treats the memory of Gregory with great freedom, and does not spare even Adrian. 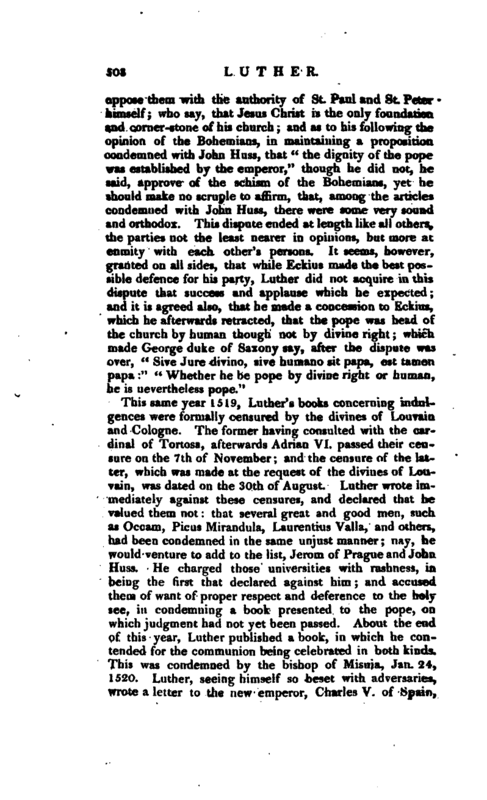 Clement VII.‘s legate, therefore, represented to the diet at Nuremberg the necessity of enforcing the execution of the edict of Worms, which had been strangely neglected by the princes of the empire; but, notwithstanding the legate’s solicitations, which were very pressing, the decrees of that diet were thought so ineffectual, that they were condemned at Rome, and rejected by the emperor. 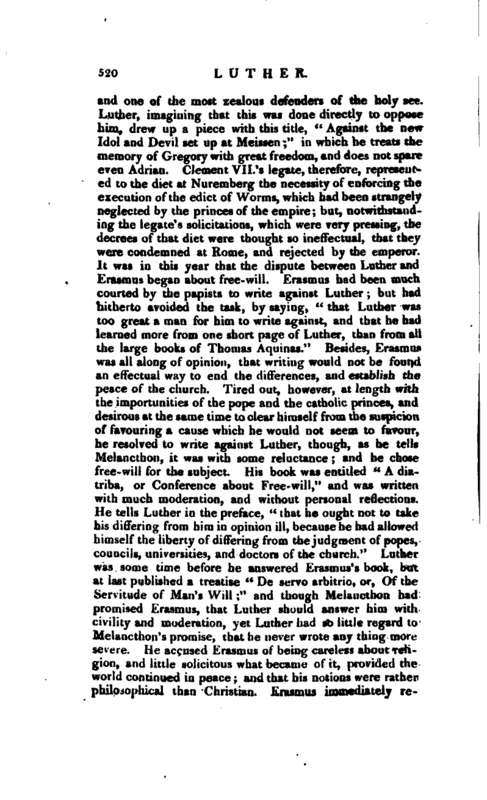 It was in this year that the dispute between Luther and Erasmus began about free-will. 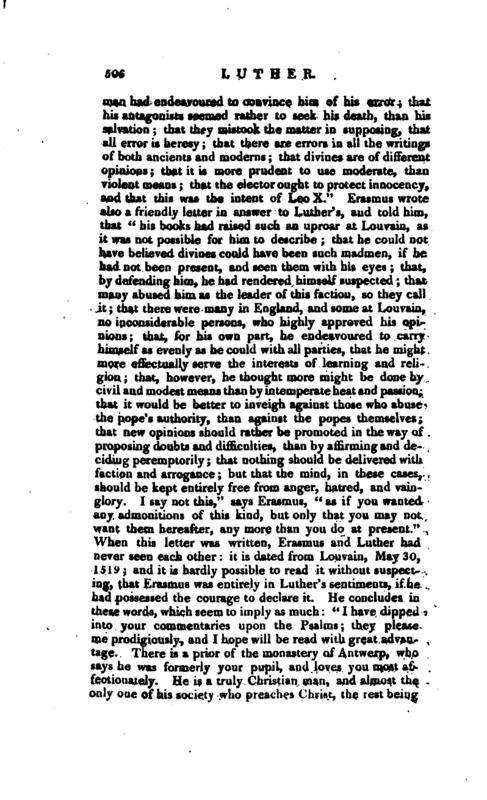 Erasmus had been much courted by the papists to write against Luther; but had hitherto avoided the task, by saying, “that Luther was too great a man for him to write against, and that he had learned more from one short page of Luther, than from all the large books of Thomas Aquinas.” Besides, Erasmus was all along of opinion, that writing would not be found an effectual way to end the differences, and establish the peace of the church. 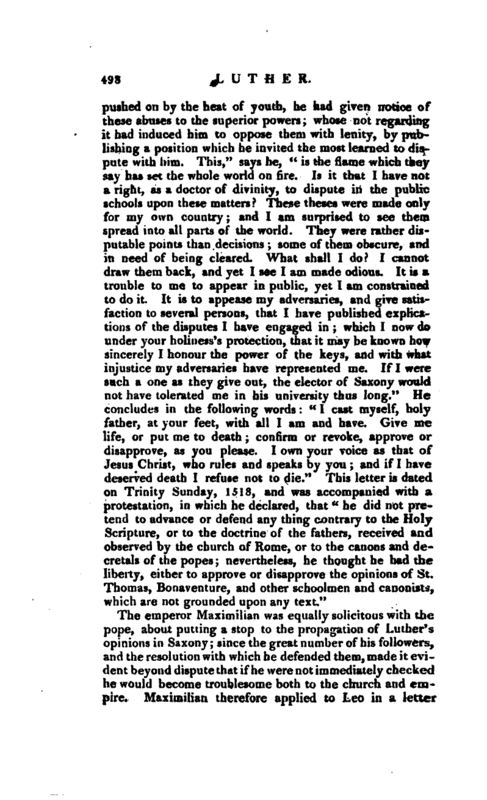 Tired out, however, at length with the importunities of the pope and the catholic princes, and desirous at the same time to clear himself from the suspicion of favouring a cause which he would not seem to favour, he resolved to write against Luther, though, as he tells Melancthon, it was with some reluctance; and he chose free-will for the subject. His book was entitled “A diatriba, or Conference about Free-will,” and was wriuen with much moderation, and without personal reflections. 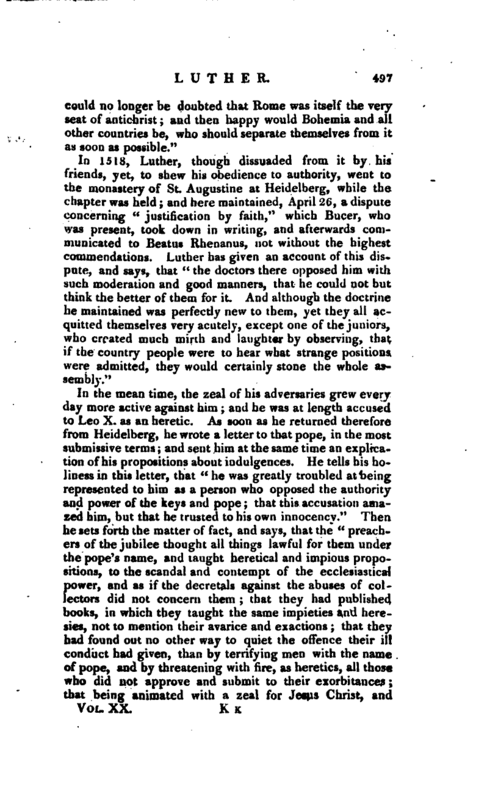 He tells Luther in the preface, “that he ought not to take his differing from him in opinion ill, because he had allowed himself the liberty of differing from the judgment of popes, councils, universities and doctors of the church.” Luther was some time before he answered Erasmus’s book, but at last published a treatise “De servo arbitrio, or, Of the Servitude of Man’s Will;” and though Melancthon had promised Krasmus, that Luther should answer him with civility and moderation, yet Luther had so little regard to Melancthon’s promise, that he never wrote any thing more severe. He accused Erasmus of being carelrsn about religion, and little solicitous what became of it, provided the world continued in peace; and that his notions were rather philosophical than Christian. Erasmus immediately | replied to Luther,- in a piece called “Hyperaspistes”. in the first part of which he answers his arguments, and in the second his personal reflections. 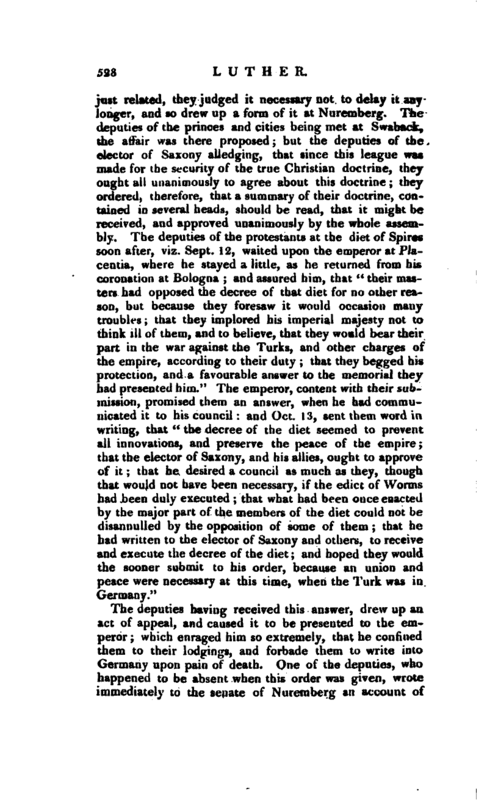 Before this resolution of the diet appeared, the elector of Saxony, and landgrave of Hesse, proposed to the deputies of Strasbiirji and Nuremberg, to nuke1 league in the | defence of those who should follow the new doctrine, and to bring the cities of Francfort and Ulm into it; but the deputies could then give no other answer, than that they would consult their cities about it. Affairs were now in great confusion in Germany; and they were not less so in Italy; for a quarrel arose between the pope and the emperor, during which Rome was twice taken, and the pope imprisoned. While the princes were thus employed in quarrelling with each other, Luther persisted in carrying on the work of the Reformation, as well by opposing the papists, as by combating the anabaptists and other fanatical sects; which, having taken the advantage of his contest ^with the church of. Rome, had sprung up and established themselves in several places. In 1527, Luther was suddenly seized with a coagulation of the blood about the heart, which had like to have put an end to his life; but recovering from this, he was attacked a second time with a spiritual temptation, which he calls, “Colaphum Satanae, a blow of Satan.” He seemed, as he tells us, to perceive at his left ear a prodigious beating, as it were of the waves of the sea, and this not only wiihin, but also without his head; and so violent withal, that he thought every moment he was going to expire. Afterwards, when he felt it only in the inner part of his head, he grew almost senseless, was all over chilly, and not able to speak: but, recovering himself a little, he applied himself to prayer, made a confession of his faith, and lamented grievously his unworthiness of martyrdom, which he had so often and so ardently desired. In this situation, he made a will, for he had a son, and his wife was again with child, in which he recommanded his family to the care of heaven: “Lord God,” says he, “I thank thee, that thou wouldst have me poor upon earth, and a beggar. I have neither house, nor land, nor possessions, nor money, to leave. Thou hast given me a wife and children take them, I beseech thee, under thy care, and preserve them, as thou hast preserved me.” He was, however, permitted to recover from this terrible condition; but he often spoke of it afterwards to his friends as one of the severest bufferings he had ever received from Satan. Perhaps our medical readers will be disposed to consider it in a very different light. The elector John of Saxony (for Frederic was dead), the elector of Brandenburg, Ernest and Francisdukes of Lunenburg, the landgrave of Hesse, and the prince of Anhalt, protested against this decree of the diet. Their reasons were, 4t Ttiat they ought not to do any thing to infringe upon the determination of the former diet, which had granted liberty in religion, till the holding of the council; that that resolution, having been taken by the unanimous consent of all the members of the empire, could not be repealed but by the like consent; that, in the diet of Nuremberg, the original cause of all the differences in religion was searched into, and that, to allay them, they had offered to the pope eighty articles, to which his holiness had given no answer; that the effect of their | consultations had always been, that the best way to end disputes and reform abuses was to hold a council; that they could not suffer opinions to be forced from them, which th^y judged true and agreeable to the word of God, before the council was held; that their ministers had proved, by invincible arguments taken out of Scripture, that the popish mass was contrary to the institution of Jesus Christ, and the practice of the apostles, so that they could not agree to what uas ordered in the diet; that they knew the judgment of their churches concerning the presence of the body and blood of Christ in the eucharist; but that they ought not to make a decree against those who were of a contrary opinion, because they were neither summoned nor heard: that they could indeed venture to approve of the clause about preaching the gospel according to the interpretation received in the church, since that did not determine the matter, it being yet in dispute what was the true church; that there was nothing more certain than the word of Go4 itself, which explains itself, and therefore they would take care, that nothing else should be taught but the Old and New Testament in their purity; that they are the only infallible rule, and that all human traditions are uncertain; that the decree of the former diet was made for the preservation of peace, but that this last would infallibly beget wars and troubles. For these reasons they could not approve of the decree of the diet, but yet would do nothing that should be blame- worthy, till a council, either general or national, should be held." Fourteen cities, viz. Strasburg, Nuremberg, Ulm, Constance, Retlingen, Windsheim, Memmingen, Lindow, Ketnpten, Hailbron, Isny, Weissemburg, Nortlingen, S. Gal, joined in this protestation, which was put into writing, and published the 19th of April, 1529, by an instrument, in which they appealed from all that should be done, to the emperor, a future council, either general or national, or to unsuspected judges; and accordingly they appointed deputies to send to the emperor, to* petition that this decree might be revoked. This was the famous protestation, which gave the name of Protestants to the reformers in Germany. The deputies having received this answer, drew up an act of appeal, and caused it to be presented to the emperor; which enraged him so extremely, that he confined them to their lodgings, and forbade them to write into Germany upon pain of death. One of the deputies, who happened to be absent when this order was given, wrote immediately to the senate of Nuremberg an account of | what had passed; and this was transmitted to the elector of Saxony, the landgrave of Hesse, and other confederates, who met at Smalkald in November. Here it was first of all proposed, to agree upon a confession of faith; which accordingly was prepared, and afterwards offered at the diet of Augsburg, in June 1530. The emperor would not suffer it to be read in a full diet, but only in a special assembly of the princes and other members of the empire; after which the assembly was dismissed, that they might consult what resolutions should be formed. 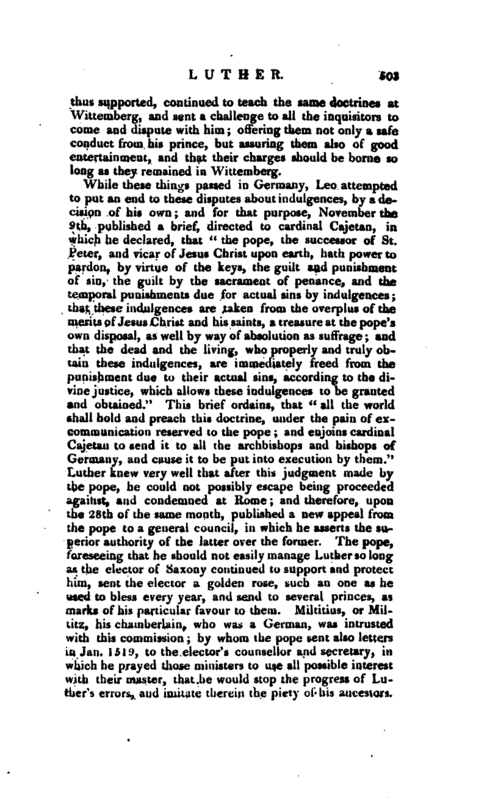 Some thought that the edict of Worms should be put in execution; others were for referring the matter to the decision of a certain number of honest, learned, and indifferent persons; a third party were for having it confuted by the catholic divines, and the confutation to be read in a full diet before the protestants; and these prevailed. The protestants afterwards presented an apology for their confession; but the emperor would not receive it; they were, however, both made public. This confession of faith, which was afterwards called “The confession of Augsburg,” was drawn up by Melancthon, the most moderate of all Luther’s followers, as was also the apology. He revised and corrected it several times, and, as Dupin tells us, could hardly please Luther at last. Maimbourg says, however, that Luther was exceedingly pleased with it, when Melancthon sent him a copy of it; and Seckendorf allows that Luther was very glad of the opportunity which was offered of letting the world know what he and his followers taught. It was signed by the elector of Saxony, the marquis of Brandenburg, Ernest and Francis dukes of Brunswick and Lurtenburg, the landgrave of Hesse, the princes of Anhalt, and the deputies of the cities of Nuremberg and Retlingen. 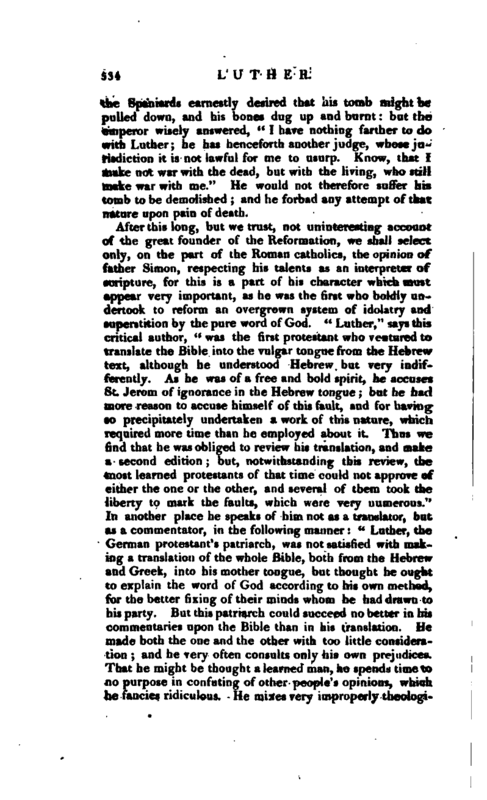 Luther had now nothing else to do but to sit down and contemplate the mighty work he had finished; and the remainder of his life was spent in exhorting princes, states, and universities, to confirm the reformation which had been brought about through him, and in publishing from time to time such writings as might encourage, direct, and aid them. The emperor threatened temporal punishments with armies, and the pope eternal with bulls and anathemas; but Luther cared for none of their threats. His friend and coadjutor Melancthon was not so indifferent, owing to the moderation and diffidence of his temper; and hence we find many of Luther’s letters, written on purpose | to comfort him under his anxieties. “I am,” says he, in one of these letters, “much weaker than you in private conflicts, if I may call those conflicts private which I have with the devil; but you are much weaker than me in public. You are all diffidence in the public cause; I, on the contrary, am very sanguine, because I am confident it is a just and a true cause, the cause of God and of Christ, which need not look pale and tremble; whereas the case is very different with me in my private conflicts, who am a very miserable sinner, and therefore have great reason to look pale and tremble. Upon this account it is, that I can be almost an indifferent spectator amidst all the noisy threats and bullyings of the papists; for if we fall, the kingdom of Christ falls with us; and, if it should fall, I had rather fall with Christ, than stand with Caesar.” So again a little farther: “You, JNlelancthon, cannot bear these disorders, and labour to have things transacted by reason, and agreeable to that spirit of calmness and moderation which your philosophy dictates. You might as well attempt to be mad with reason. Do not you see that the matter is entirely out of your power and management, and that even Christ himself forbids your measures to take place?” This letter was written in 1530. In 1533 Luther wrote a consolatory epistle to the citizens of Oschatz, who had suffered some hardships for adhering to the Augsburg confession of faith; in which, among other things, he says, " The devil is the host, and the world is his inn, so that wherever you come, you shall be sure to find this ugly host.’ 1 He had also about this time a warm controversy with George duke of Saxony, who had such an aversion to Luther’s doctrine, that he obliged his subjects to take an oath that they would never embrace it. 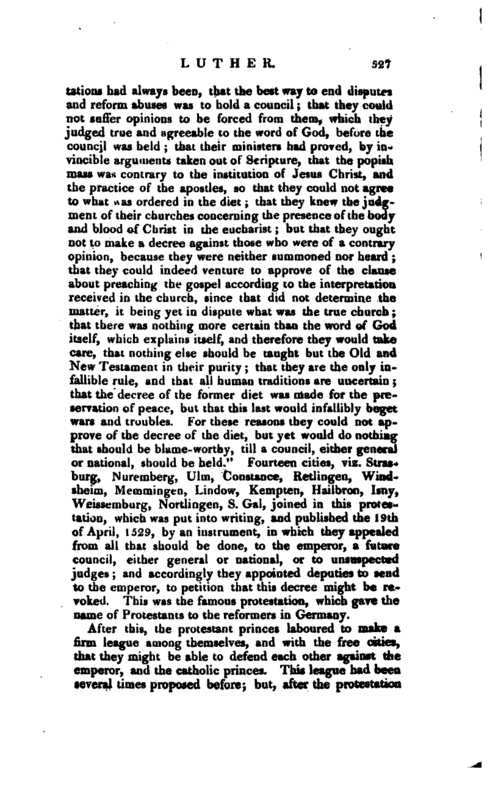 Sixty or seventy citizens of Leipsic, however, were found to have deviated a little from the catholic doctrine, in some point or other, and they were known previously to have consulted Luther about it on which George complained to the elector John, that, Luther had not only abused his person, but also preached up rebellion among his subjects. The elector ordered Luther to be acquainted with this, and to be told at tle same time, that if be did not clear himself of the charge, he could not possibly escape punishment. Luther, however, easily refuted the accusation, by proving that he had been so fur from stirring up his subjects against him on the score of religion, that, on the contrary, he had | exhorted them rather to undergo the greatest hardships, and even to suffer themselves to be banished. In 1534 the Bible translated by him into German was first printed, as the old privilege, dated “at Bibliopolis, under the elector’s own hand, shews, and was published the year after. He also published this year a book” against masses and the consecration of priests,“in which he relates a conference he had with the devil upon those points; for it is remarkable in Luther’s whole history, that he never had any conflicts of any kind within, which he did not attribute to the personal agency of the devil. 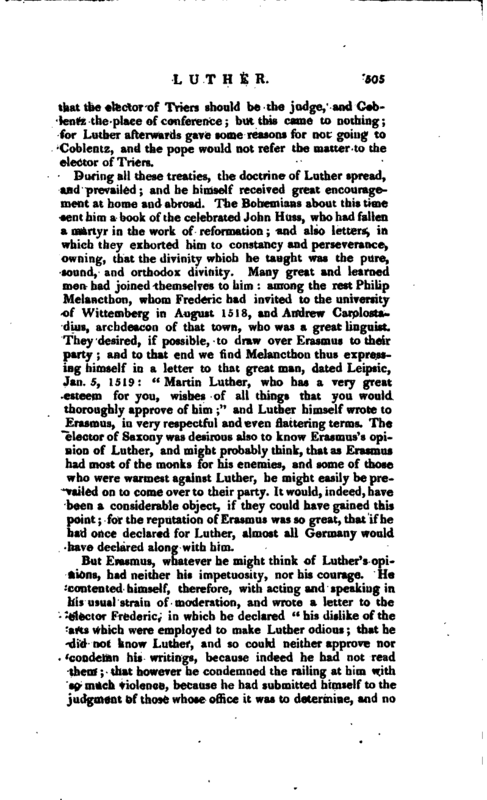 In Feb. 1537, an assembly was held at Smalkald about matters of religion, to which Luther and Melancthoii were called. At this meeting Luther was seized with so dangerous an illness, that there was no hope of his recovery. He was afflicted with the stone, and had a stoppage of urine for eleven days. In this condition he insisted on travelling, notwithstanding all his friends could do to prevent him: his resolution, however, was attended with a good effect, for the night after his departure he began to be better. As he was carried along he made his will, in which he bequeathed his detestation of popery to his friends and brethren; agreeably to what he often used to say,” Pestis cram vivus, moriens ero mors tua, papa;“that is,” I was the plague of popery in my life, and shall be its destruction in my death." This year the court of Rome, finding it impossible to deal with the protestants by force, began to have recourse to stratagem. They affected therefore to think, that though Luther had indeed carried things to a violent extreme, yet what he had pleaded in defence of these measures was not entirely without foundation. They talked with a seeming shew of moderation; and Pius 111. who succeeded Clement VII. proposed a reformation first among themselves, and even went so far as to fix a place for a council to meet at for that purpose. But Luther treated this farce as it deserved to be treated; unmasked and detected it immediately; and, to ridicule it the more strongly, caused a picture to be drawn, in which was represented the pope seated on high upon a throne, some cardinals about him with fox’s tails, and seeming to evacuate upwards and downwards, “sursum deorsum repurgare,” as Melchior Adam expresses it. This was fixed against the title-page, to let the readers see at once the scope and design of the | book which was, to expose that cunning and artifice with which those subtle politicians affected to cleanse and purify themselves from their errors and superstitions. Luther published about the same time “A Confutation of the pretended grant of Constanline to Sylvester bishop of Rome,” and also “Some letters of John Huss,” written from his prison at Constance to the Bohemians. In this manner he was employed till his death, which happened in 1546. That year, accompanied by Melancthon, he paid a visit to his own country, which he had not seen for many years, and returned again in safety. But soon after he was called thither again by the earls of Mansfelt, to compose some differences which had arisen about their boundaries. He had not been used to such matters; but because he was born at Isleben, a town in the territory of Mansfelt, he was willing to do his country what service he could, even in this way. Preaching his last sermon, therefore, at Wittemberg, Jan. 17, he set off the 23d; and at Hall in Saxony lodged with Justus Jonas, with whom he stayed three days, because the waters were out. 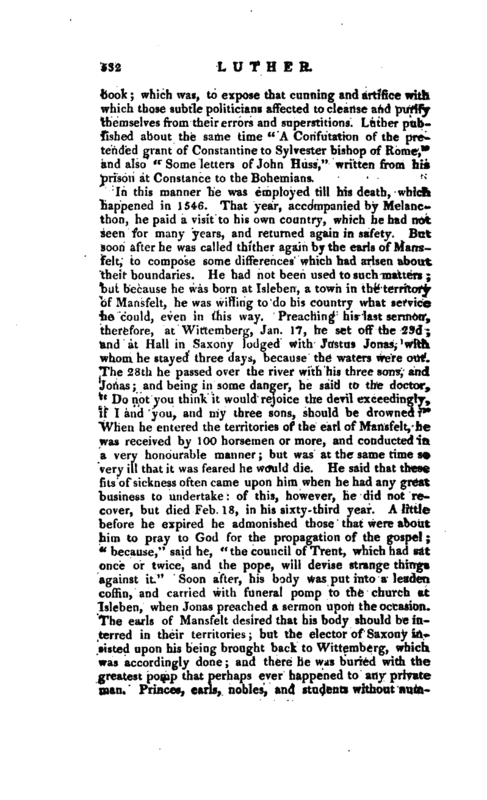 The 28th he passed over the river with his three sons, and Jonas and being in some danger, he said to the doctor, “Do not you think it would rejoice the deril exceedingly, if I and you, and my three sons, should be drowned” When he entered the territories of the earl of Mansfelt, he was received by 100 horsemen or more, and conducted in a very honourable manner; but was at the same time so very ill that it was feared he would die. He said that these fits of sickness often came upon him when he had any great business to undertake: of this, however, he did not recover, but died Feb. 18, in his sixty-third year. 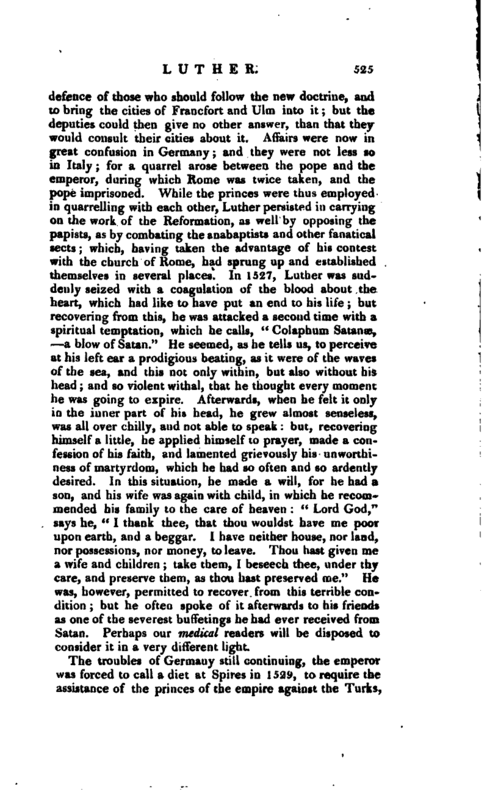 A little before he expired he admonished those that were about him to pray to God for the propagation of the gospel “because,” said he, “the council of Trent, which had sat once or twice, and the pope, will devise strange things against it.” Soon after, his body was put into a leaden coffin, and carried with funeral pomp to the church at Isleben, when Jonas preached a sermon upon the occasion. The earls of Mansfelt desired that his body should be interred in their territories; but the elector of Saxony intsted upon his being brought back to Wittemberg, which was accordingly done; and there he was buried with the greatest pomp that perhaps ever happened to any private mail. 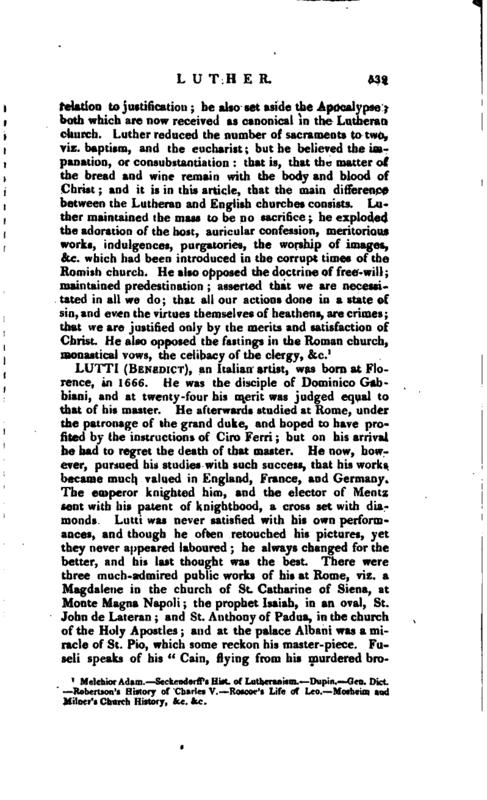 Princes, earls, nobles, aad students without | number, attended the procession; and Melancthon made his funeral oration. A thousand falsehoods were invented by the papists about his death. Some said that he died suddenly; others, that he killed himself; others, that the devil strangled him; others, that his corpse stunk so abominably that they were forced to leave it in the way as it was carried to be interred. 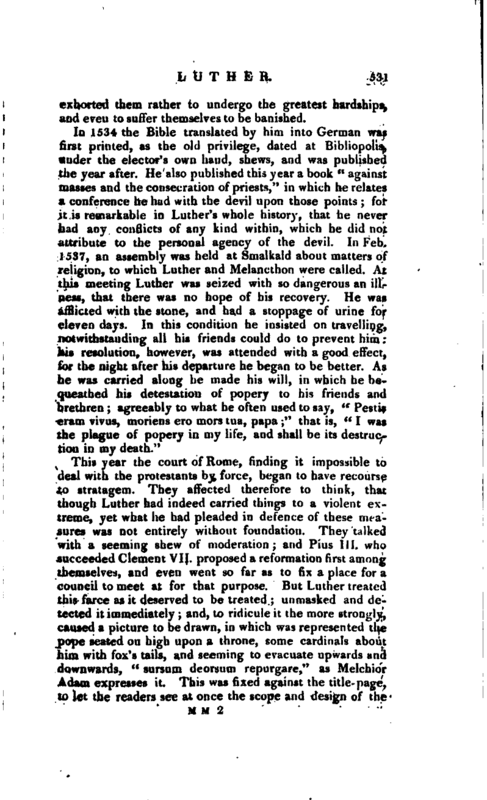 Similar slanders were even invented about his death, while he was yet alive for a pamphlet was published at Naples, and in other places of Italy, the year before, wherein was given the following account: “Luther, being dangerously sick, desired to communicate, and died as soon as he had received the viaticum. As he was dying, he desired his body might be laid upon the altar, to be adored; but that request being neglected, he was buried. When, lo! at his interment there arose a furious tempest, as if the world was at an end; and the terror was universal. Some, in lifting their hands up to heaven, perceived that the host, which the deceased had presumed to take, was suspended in the air; upon which it was gathered up with great veneration, and laid in a sacred place, and the tempest ceased for the present; but it arose the night following with greater fury, and filled the whole town with consternation; and the next day Luther’s sepulchre was found open and empty, and a sulphureous stench proceeded from it, which nobody could bear. 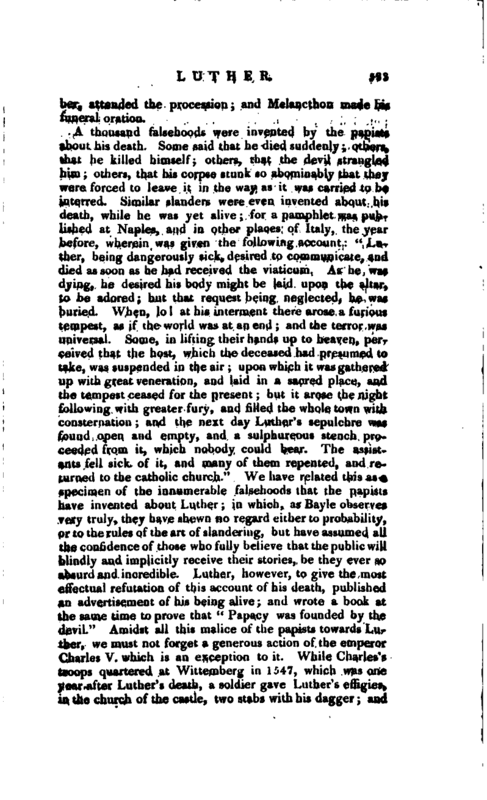 The assistants fell sick of it, and many of them repented, and returned to the catholic church.” We have related this as a specimen of the innumerable falsehoods that the papists have invented about Luther; in which, as Bayle observes very truly, they have shewn no regard either to probability, or to the rules of the art of slandering, but have assumed all the confidence of those who fully believe that the public will blindly and implicitly receive their stories, be they ever so absurd and incredible. 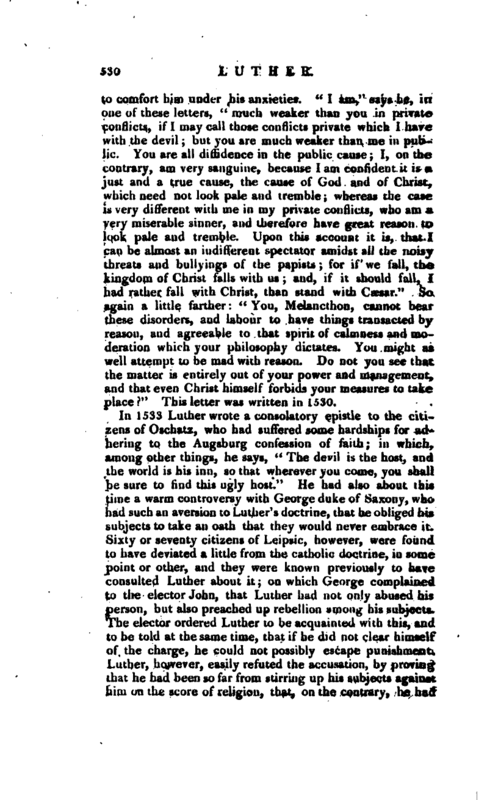 Luther, however, to give the most effectual refutation of this account of his death, published an advertisement of his being alive; and wrote a book at the same time to prove that “Papacy was founded by the devil.” Amidst all this malice of the papists towards Luther, we must not forget a generous action of the emperor Charles V. which is an exception to it. While Charles’s troops quartered at Wittemberg in 1547, which was one year after Luther’s death, a soldier gave Luther’s effigies, in the church of the castle, two stabs with his dagger; and | the Spaniards earnestly desired that his tomb might be pulled down, and his bones dug up and burnt: but the emperor wisely answered, “I have nothing farther to do with Luther; he has henceforth another judge, whose jurisdiction it is not lawful fur me to usurp. Know, that I make not war with the dead, but with the living, who still make war with me.” He would not therefore suffer his tomb to be demolished; and he forbad any attempt of that nature upon pain of death. 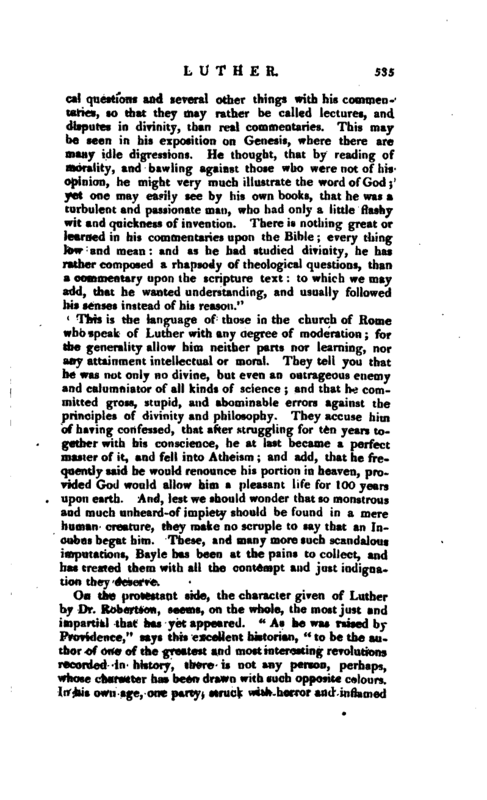 This is the language of those in the church of Rome who speak of Luther with any degree of moderation; for the generality allow him neither parts nor learning, nor any attainment intellectual or moral. They tell you that he was not only no divine, but even an outrageous enemy and calumniator of all kinds of science; and that he committed gross, stupid, and abominable errors against the principles of divinity and philosophy. 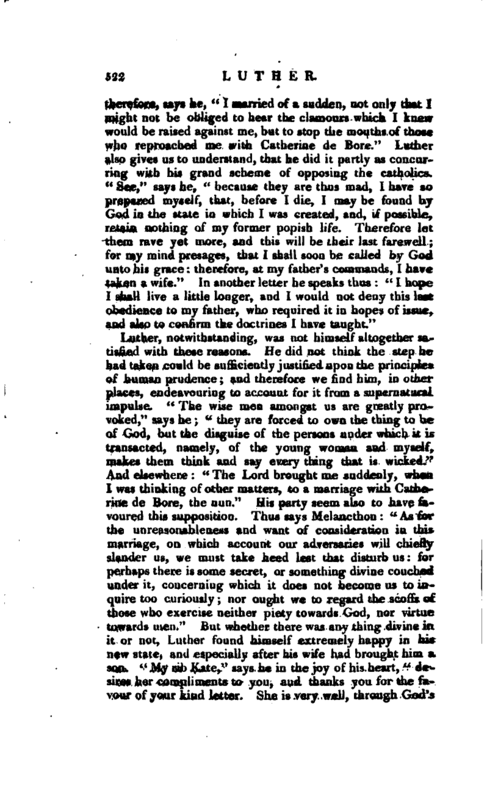 They accuse him of having confessed, that after struggling for ten years together with his conscience, he at last became a perfect master of it, and fell into Atheism; and add, that he frequently said he would renounce his portion in heaven, provided God would allow him a pleasant life for 100 years upon earth. And, lest we should wonder that so monstrous and much unheard-of impiety should be found in a mere human creature, they make no scruple to say that an Incubus begat him. These, and many more such scandalous imputations, Bayle has been at the pains to collect, and has treated them with all the contempt and just indignation they deserve. On the protestant side, the character given of Luther by Dr. Robertson, seems, on the whole, the most just and impartial that has yet appeared. “As he was raised by Providence,” says this excellent historian, " to be the author of one of the greatest and most interesting revolutions recorded in history, there is not any person, perhaps, whose character has been drawn with such opposite colours. In his own age, one party, struck with horror aud inflamed | with rage, when they saw with what a daring hand he overturned everything which they held to be sacred, or valued as beneficial, imputed to him not only the defects and vices of a man, but the qualities of a demon. 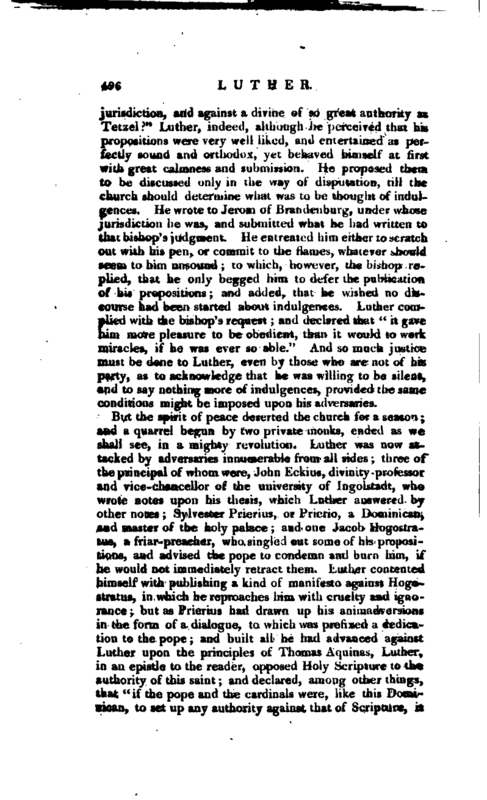 The other, warmed with the admiration and gratitude which they thought he merited, as the restorer of light and liberty to the Christian church, ascribed to hiui perfections above the condition of humanity, and viewed all his actions with a veneration bordering on that which should be paid only to those who are guided by the immediate inspiration of heaven. It is his own conduct, not the undistinguishing censure or the extravagant praise of his contemporaries, that ought to regulate the opinions of the present age concerning him. Zeal for what he regarded as truth; undaunted intrepidity to maintain his own system; abilities, both natural and acquired, to defend his principles; and unwearied industry in propagating them; are virtues which shine so conspicuously in every part of his behaviour, that even his enemies must allow him to have possessed them in an eminent degree. To these may be added, with equal justice, such purity and even austerity of manners, as became one who assumed the character of a reformer; such sanctity of life as suited the doctrine which he delivered; and such perfect disinterestedness, as affords no slight presumption of his sincerity. 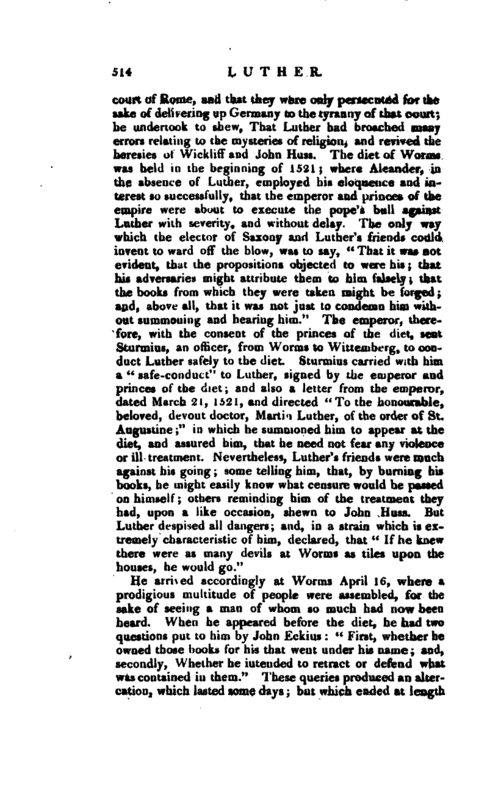 Superior to all selfish considerations, a stranger to the elegancies of life, and despising its pleasures, he left the honours and emoluments of the church to his disciples, remaining satisfied himself in his original state of professor in the university, and pastor of the town of Wittemberg, with the moderate appointments annexed to these offices. His extraordinary qualities were allayed by no inconsiderable mixture of human frailties and human passions. These, however, were of such a nature, that they cannot be imputed to malevolence or corruption of heart, but seem to have taken their rise from the same source with many of his virtues. His mind, forcible and vehement in all its operations, roused by great objects, or agitated by violent passions, broke out, on many occasions, with an impetuosity which astonishes men of feebler spirits, or such as are placed in a more tranquil situation. By carrying some praise-worthy dispositions to excess, he bordered sometimes on what was culpable, and was often betrayed into actions which exposed him to censure. His confidence that his own opinions were well-founded, | appreached to arrogance; his courage in asserting them, to rashness; his firmness in adhering to them, to obstinacy; and his zeal in confuting his adversaries, to rage and scurrility. Accustomed himself to consider every thing as subordinate to truth, he expected the same deference for it from other men; and, without making any allowances for their timidity or prejudices, he poured forth against such as disappointed him in this particular, a torrent of invective mingled with contempt. Regardless of any distinction of rank or character when his doctrines were attacked, he chastised all his adversaries indiscriminately, with the same rough hand: neither the royal dignity of Henry VIII, nor the eminent learning and abilities of Erasmus, screened them from the same gross abuse with which he treated Tetzel or Eckius. "But these indecencies of which Luther was guilty, must not be imputed wholly to the violence of his temper. They ought to be charged in part on the manners of the age. 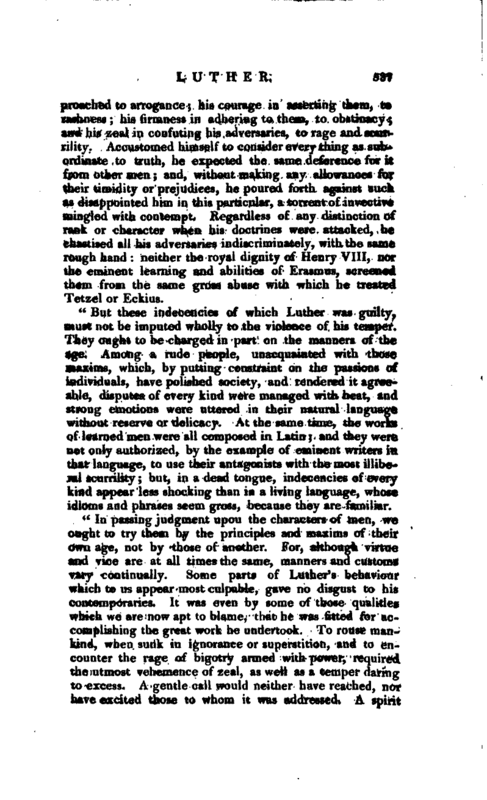 Among a rude people, unacquainted with those maxims, which, by putting constraint on the passions of individuals, have polished society, and rendered it agreeable, disputes of every kind were managed with heat, and strong emotions were uttered in their natural language without reserve or delicacy. At the same time, the works of learned men were all composed in Latin; and they were not only authorized, by the example of eminent writers in that language, to use their antagonists with the most illiberal scurrility; but, in a dead tongue, indecencies of every kind appear less shocking than in a living language, whose idioms and phrases seem gross, because they are familiar. His works were collected after his death, and printed at Wittemberg in seven volumes folio. Catherine de Bore survived her husband a few years, and continued the first year of her widowhood at Wittemberg, though Luther had advised her to seek another place of residence. She went from thence in 1.547, when the town was surrendered to the emperor Charles V. Before her departure, she had received a present of fifty crowns from Christian III. king of Denmark; and the elector of Saxony, and the counts of Mansfelt, gave her good tokens of their liberality. Wich these additions to what Luther had left her, she was enabled to maintain herself and her family handsomely. She returned to Wittemberg, when the town was restored to the elector, where she lived a very devout and pious life, till the plague obliged her to leave it again in 1552. She sold what she had at Wittemberg, and retired to Torgau, with a resolution to end her life there. An unfortunate mischance betel her in her journey thither, which proved fatal to her. The horses growing unruly, and attempting to run away, she leaped out of the vehicle, and had a fall, of which she died about a quarter of a year after, at Torgau, Dec. 20, 1552. 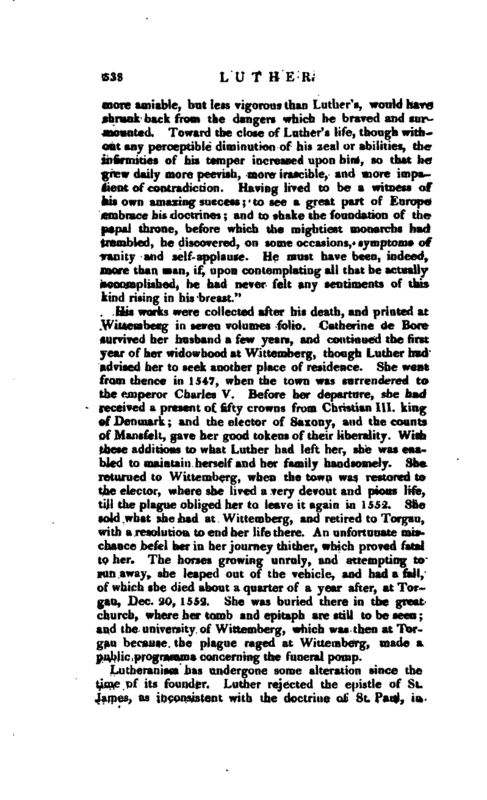 She was buried there in the great church, where her tomb and epitaph are still to be seen; and the university of Wittemberg, which was then at Torgau because the plague raged at Wittemberg, made a public programma concerning the funeral pomp. Melehior Adam. 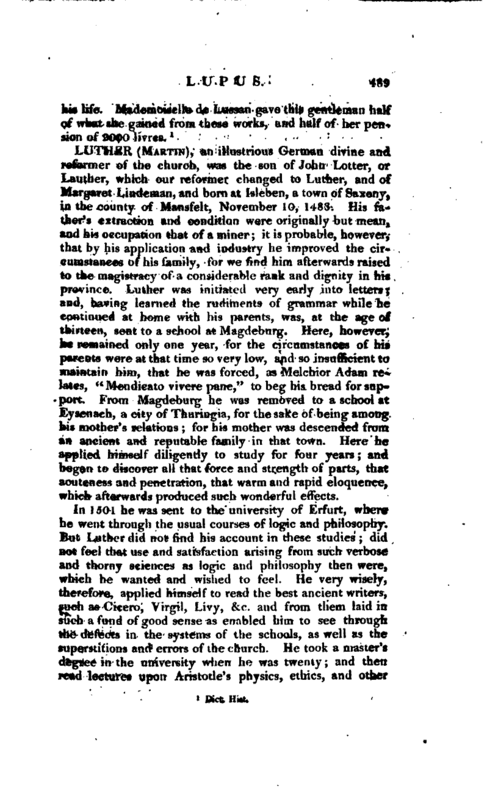 Seckendorff’s Hist, of Lutheranism. Dupin. Gen. Dict. Robertson’s History of Charles V. Roscoe’s Life of Leo, Mosheim and Milner’s Church History, &c. &c.